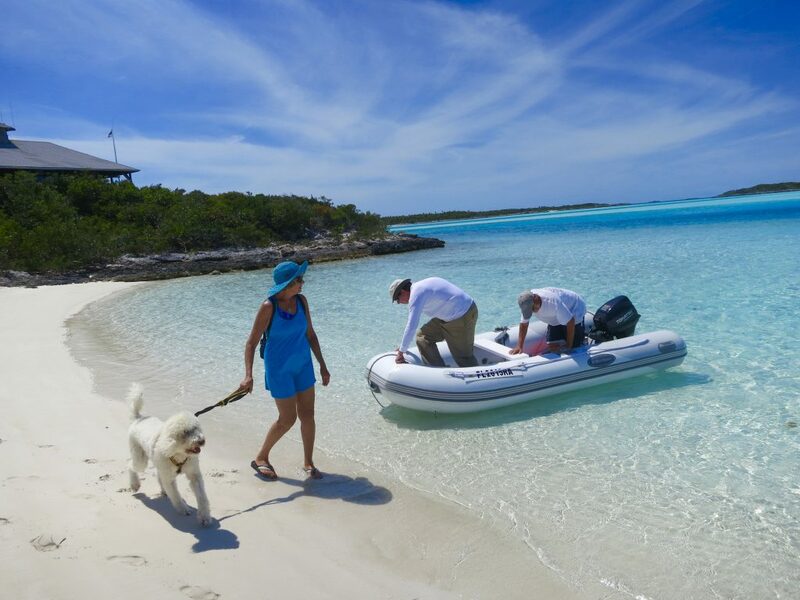 Our usual cruising schedule is to leave Stuart after Thanksgiving, head south to Miami stopping in Lake Worth and Ft. Lauderdale, and wait at Dinner Key Mooring Field to cross the Atlantic to Bimini. Invariably we get stuck in Miami waiting for weeks to cross with favorable weather conditions and have never made it to the Bahamas before January 1. This year we are leaving in November and hope to have better results. 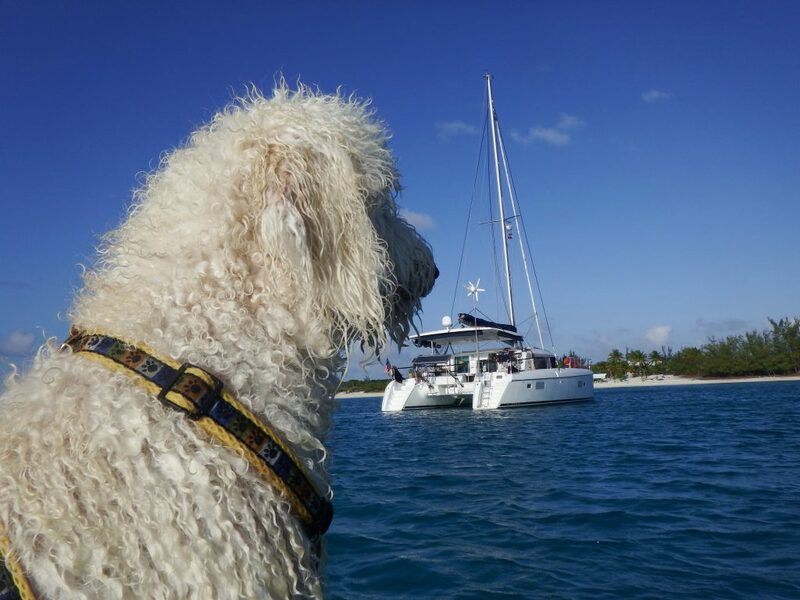 Once we are back in Stuart at the dock in June, we are no longer spending our days sailing, moving from island to island, anchoring, enjoying the beaches of the Bahamas and connecting with cruiser friends old and new. Very quickly we get back into our land mode and the boat becomes a floating condo tied to a dock. No longer do we have to depend on our diesel Onan Generator, gas Honda Generator, solar panels, and wind generator for power. Since we are plugged into shore power at the dock, we can once again freely use the microwave/convection oven, blow dryer, curling iron, toaster, coffee grinder, air conditioner, have unlimited TV watching, and use everything else that has to be plugged in without using up the power stored in the batteries. We could and sometimes do use all of these appliances while cruising, but the generator must be running for anything that creates heat. 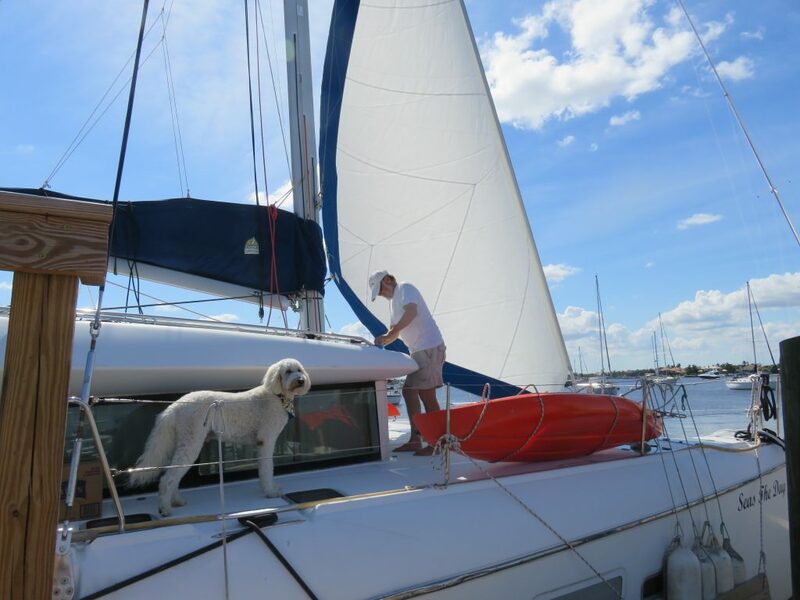 We don’t have to make reverse osmosis water while at the dock, and have unlimited city water to fill our tanks with a hose, wash the boat, take longer showers and give Sailor much needed baths. 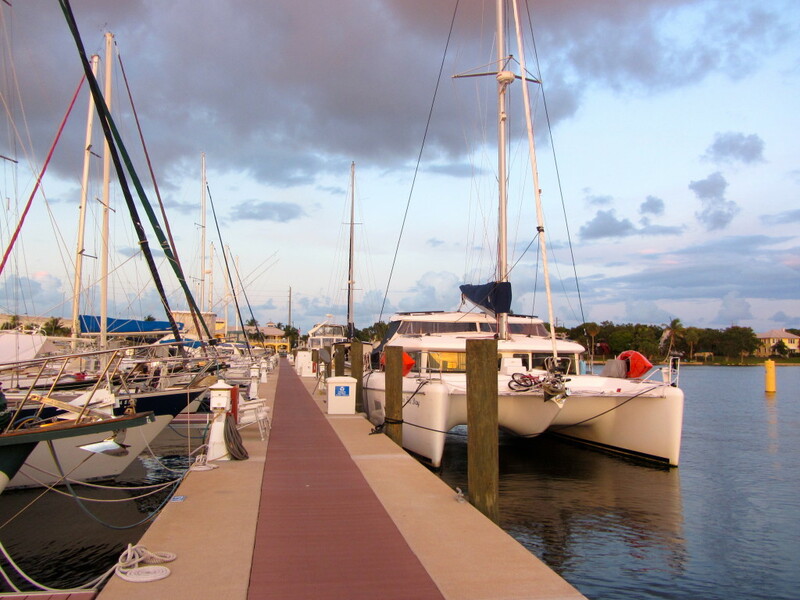 We have fast free wifi at our marina so we don’t have to pay for the more expensive data in the Bahamas or use much of our Sprint and AT&T data. A pumpout boat comes to us once a week to empty the holding tanks for free. In Georgetown we pay between $20 and $30 per pumpout and that is the only place we visit that has a pumpout boat. 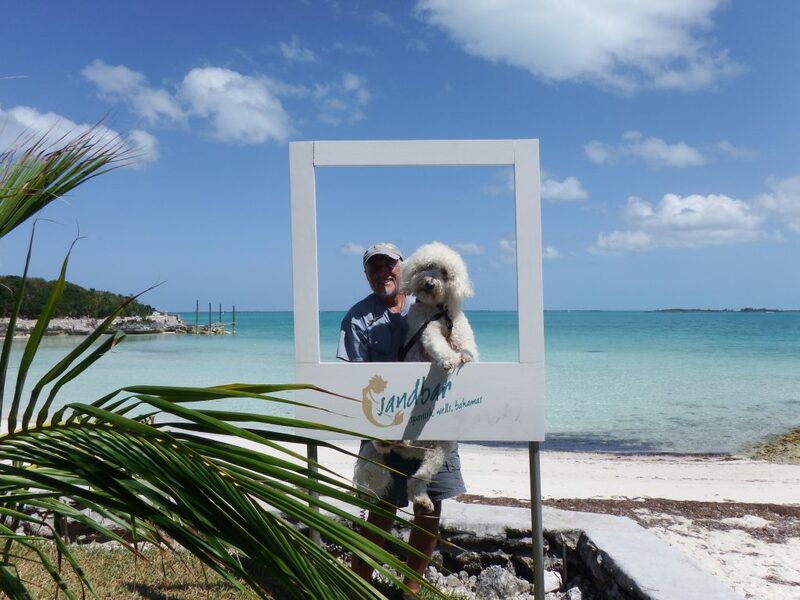 We get our car out of storage and have all the stores and shopping we need within a few miles of the marina rather than going to mostly small stores with limited and expensive food items in the Bahamas. Ordering by mail becomes possible again and our Amazon Prime purchases start arriving at the marina before we do. We can have items sent to the Bahamas, but shipping is very expensive and we pay a high customs fee based on the cost of the item. 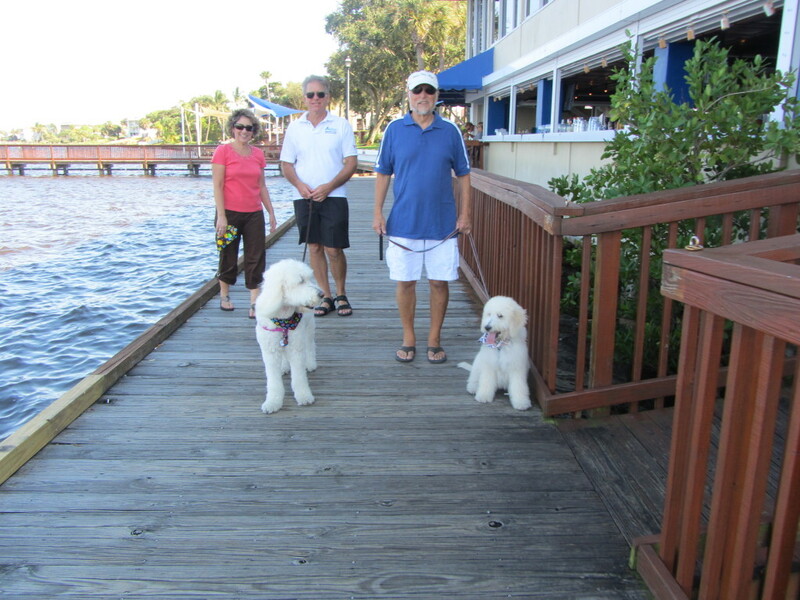 Yoga studio classes and water aerobics are back on my schedule, and instead of walking Sailor on sandy beaches, Mark and Sailor are strolling on the streets and in nearby parks in Stuart. 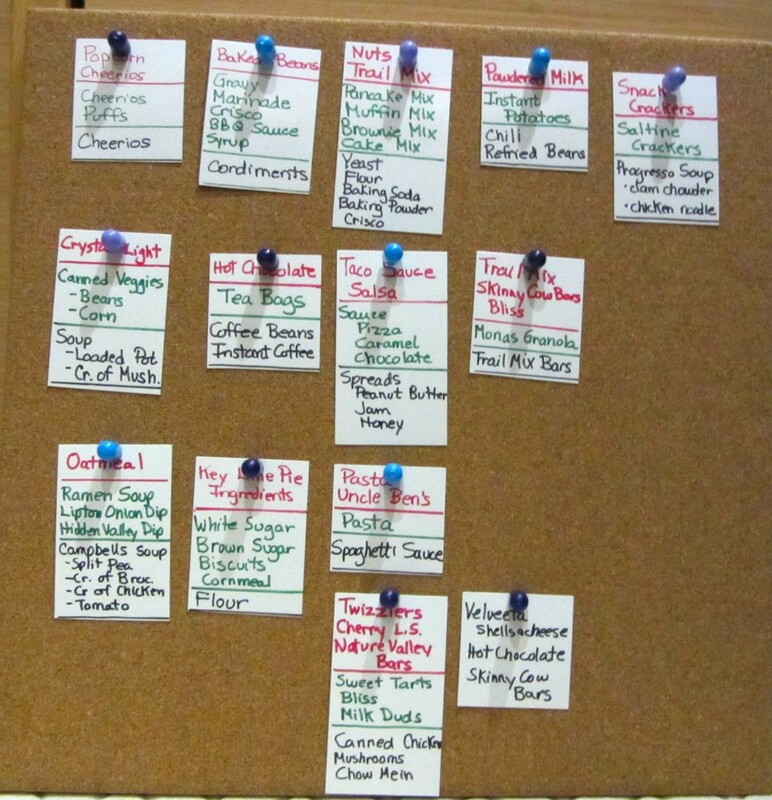 Mark makes the dreaded “to do list” but doesn’t feel rushed to complete it quickly. 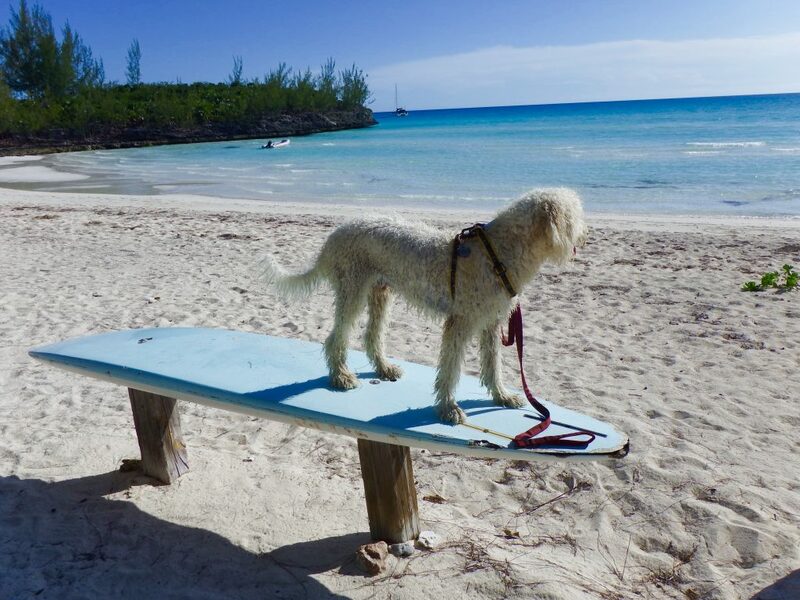 Our marina is 10 minutes from the ocean so Sailor still gets to visit beaches, just not twice a day, every day. 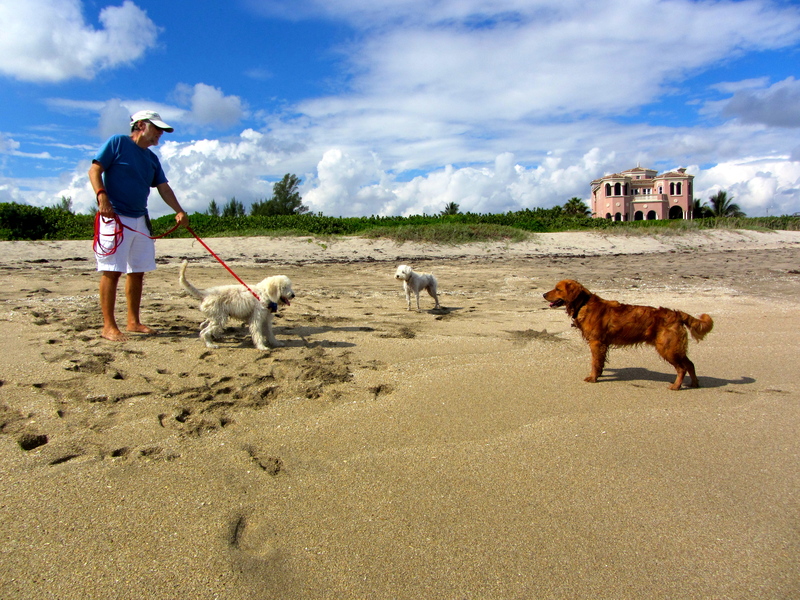 He has lots of Goldendoodle friends in the area and we get together occasionally for beach romps. 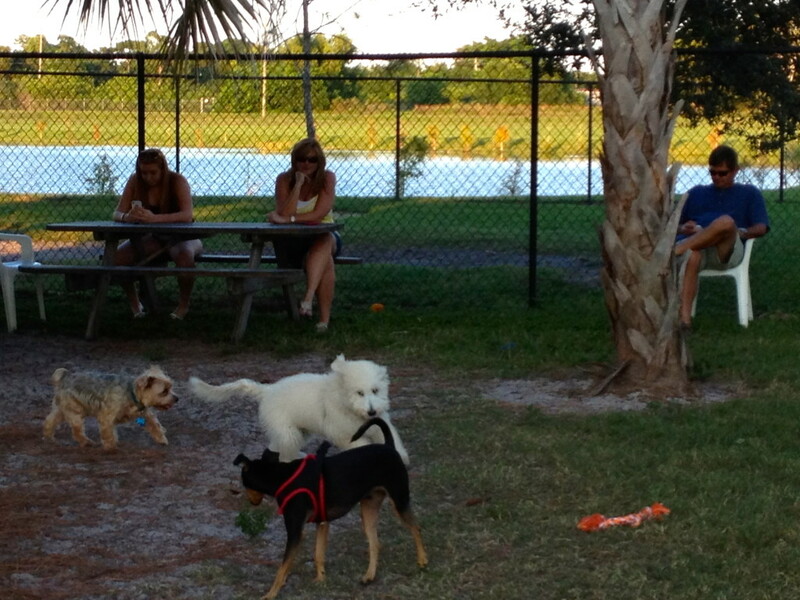 Luckily, Stuart is a very dog friendly area. We quickly fall into new patterns and forget about boat chores for awhile. However, soon the lists start to be checked off and there are always repairs to make and new things to buy. This year our radar unit had to be replaced, new shower and sink faucets were purchased and installed, as wells as zincs, a gear box for the anchor windlass, and 200 feet of new anchor chain. Our Honda generator needed to be repaired, we had to buy a new jib sail, and the list went on. However, just as Mark would start on a new project, something else had to be fixed, like a bilge pump suddenly wasn’t working so that went to the top of the list. Parts are much easier to get here by mail or in stores, so we try to bring extras of everything we use or might need to repair along the way. At the top of this list are parts for the watermaker since almost every year some part fails. When Mark replaced the radar unit, he first went up to take the old one down, lowered it in a bag to me and then came down. After resting, he went up again to install the new one which I raised in a bag to him. Thankfully when he came down and turned the radar on at the nav station instrument panel it worked! He went up in a bosun’s chair, with two lines tied to it. I brought him up using an electric winch, first raising one line, locking it, and then raising the other, reversing the process on the way down. The winch is controlled by foot pedals so it takes no strength on my part. 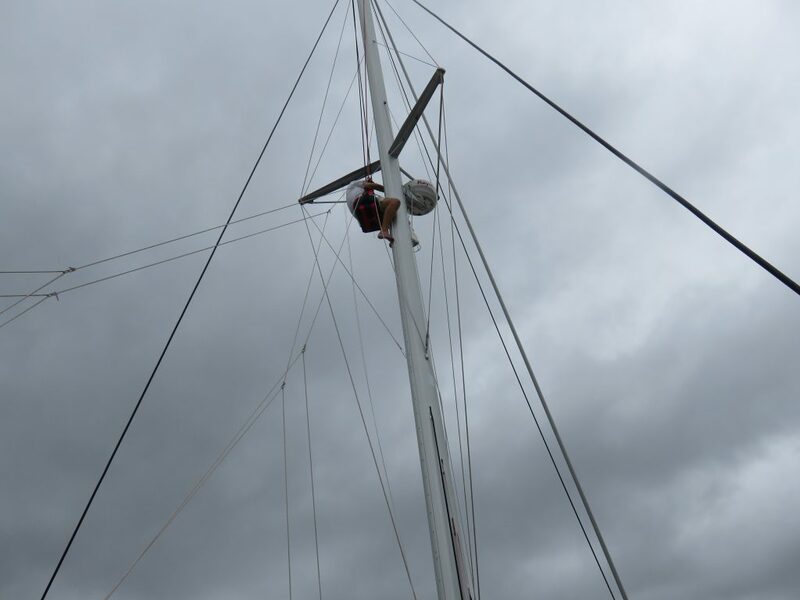 We went very slowly and it’s as safe as we can make it, but very tiring for Mark to keep his legs wrapped around the mast. It’s not a job he enjoys. One of the greatest things about cruising is the friends we have made. We always make it a point to meet sailors on other Lagoon 420’s and share new items to buy or ways to improve things on the boat. 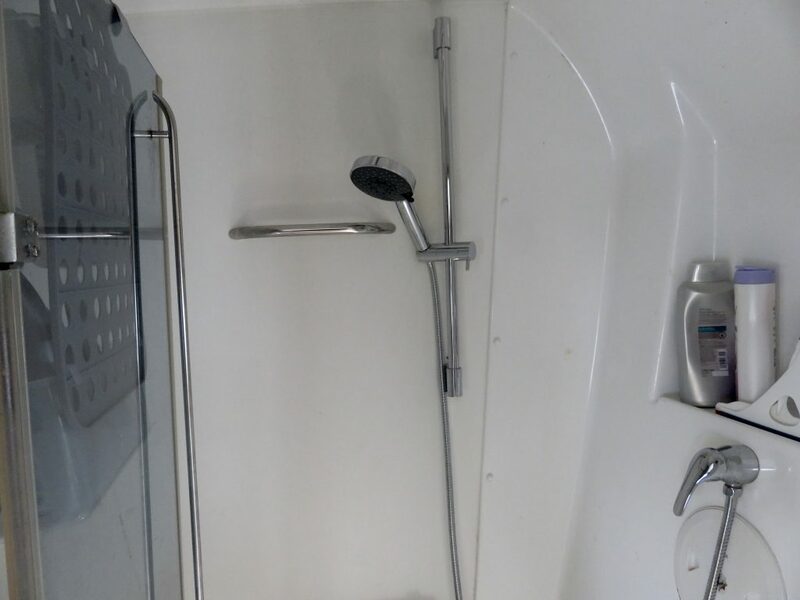 We have gotten many suggestions from friends Karen and Matt on SV Where 2, including the Amazon link for wonderful new shower heads and sink faucets. 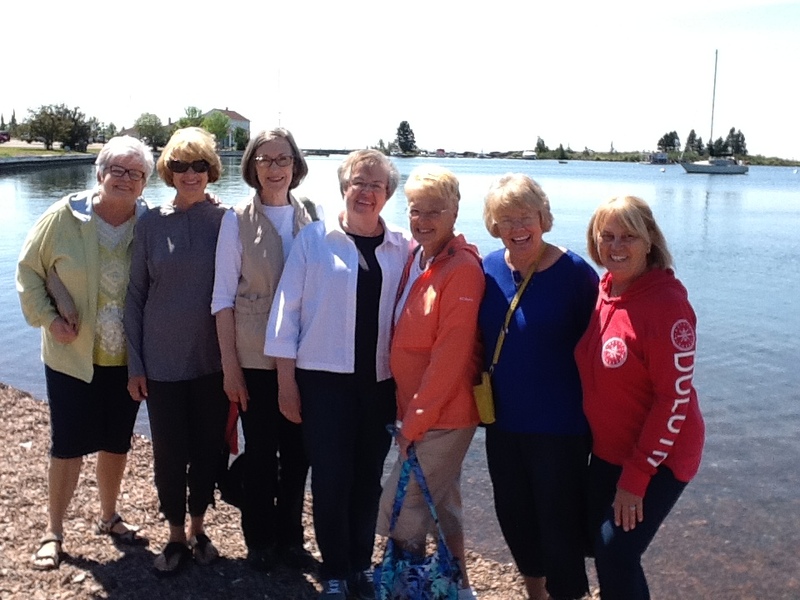 We got a nice break from the Florida summer heat when we drove to Duluth, Minnesota in July for a class reunion. Actually our classmates turn 70 this year so it was a birthday party. Taking advantage of the fact that a group of us who have been close friends since elementary school were all there, we took a road trip up the north shore of Lake Superior and spent several days together in Grand Marais, Minnesota. We had a fantastic time sharing memories and making new ones. There is nothing more special regarding friendships, in my opinion, than the ones from childhood. I would say we are all looking pretty good as we reach 70 years old. 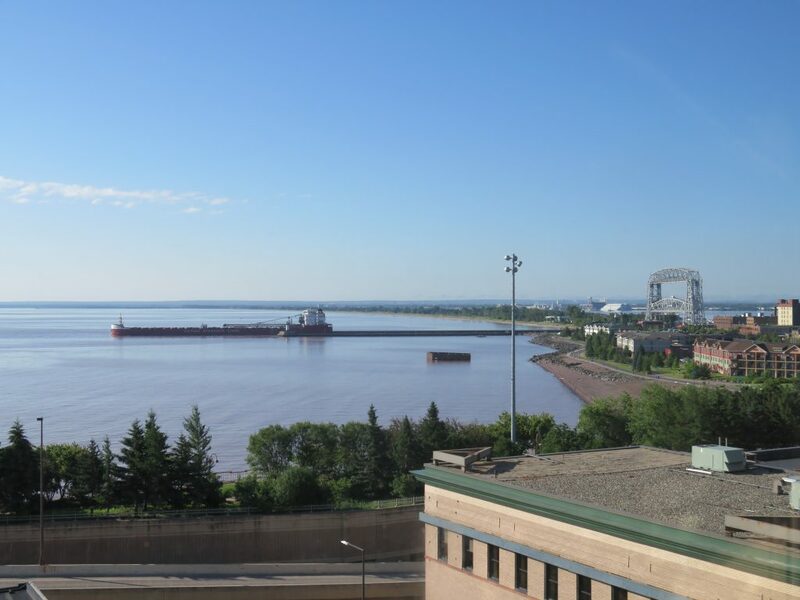 The first photo was taken in Grand Marais and the second at one friend’s house in Duluth. 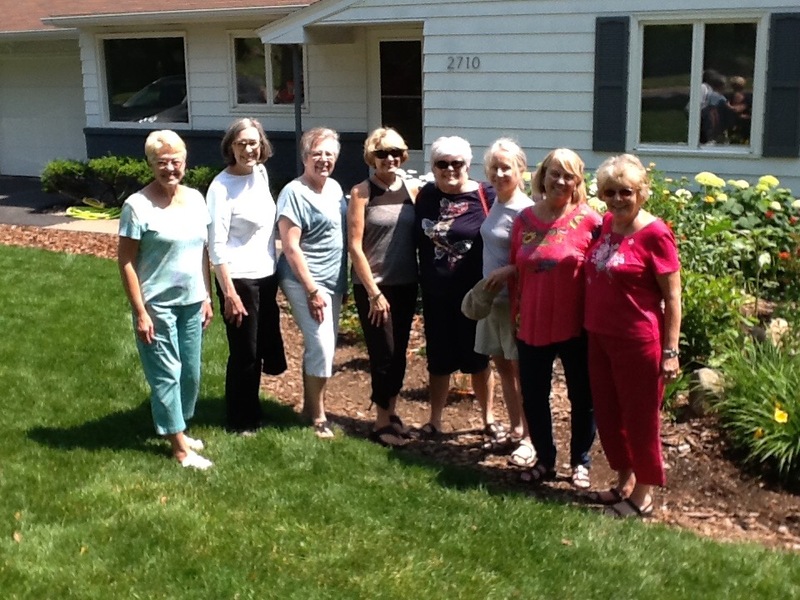 The eight of us have stayed in constant contact for over 50 years, first with snail mail “chain” letters where we each added our letter to the rest and sent the fat envelope on to the next person who replaced her letter with a new one, and now we communicate via email, regularly updating the group with our latest news. This was the first time in many years we were all together in one place. 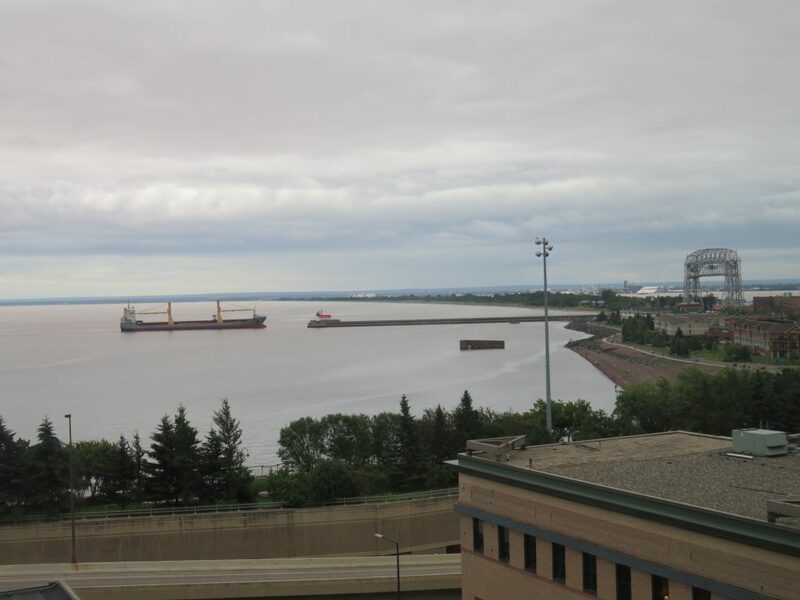 While in Duluth we stayed at a Sheraton Hotel with a gorgeous view of Lake Superior. They allow, and in fact welcome, dogs up to 80 pounds. 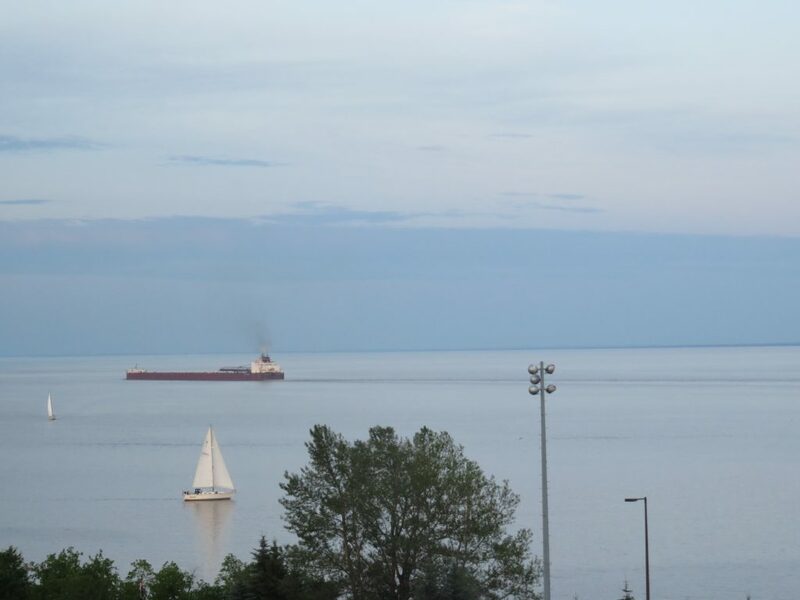 I could stare for hours out at the lake watching the big ships come through the canal in the the harbor and smaller boats sailing and motoring near shore. 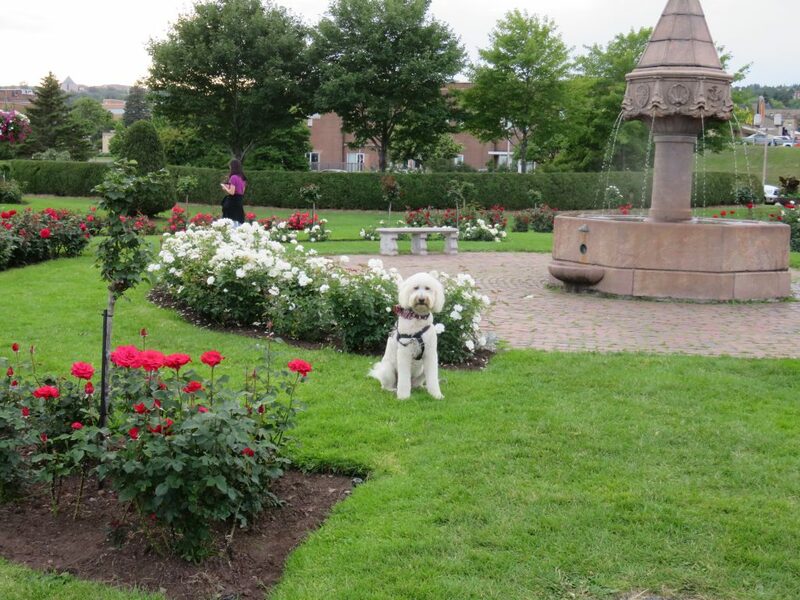 We were able to stroll along the Lakewalk and stop at the beautiful parks along the way, including the Rose Garden pictured below. 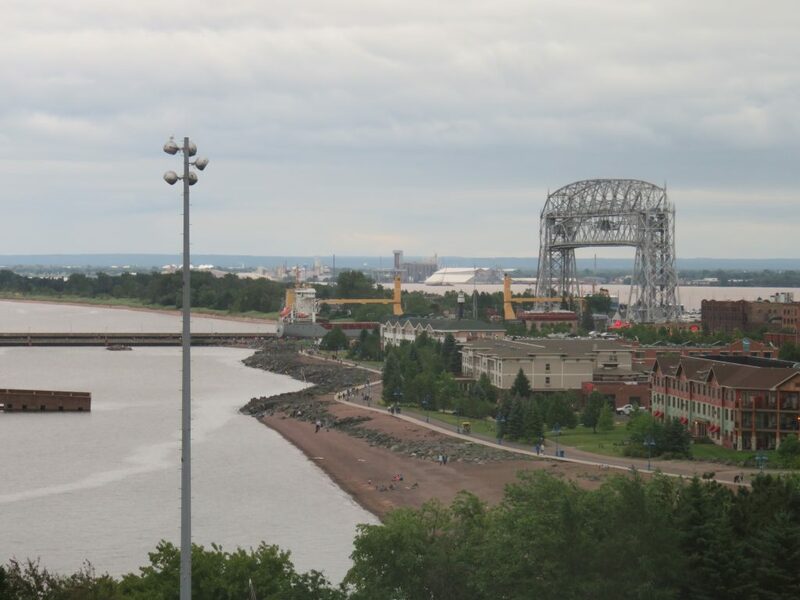 Duluth has changed a great deal since we left it in the late 60’s and has become a popular tourist destination. The lake views were all from our hotel room. The months ticked by and soon it was September and then October. As we were going along crossing things off our lists, Hurricane Matthew formed. 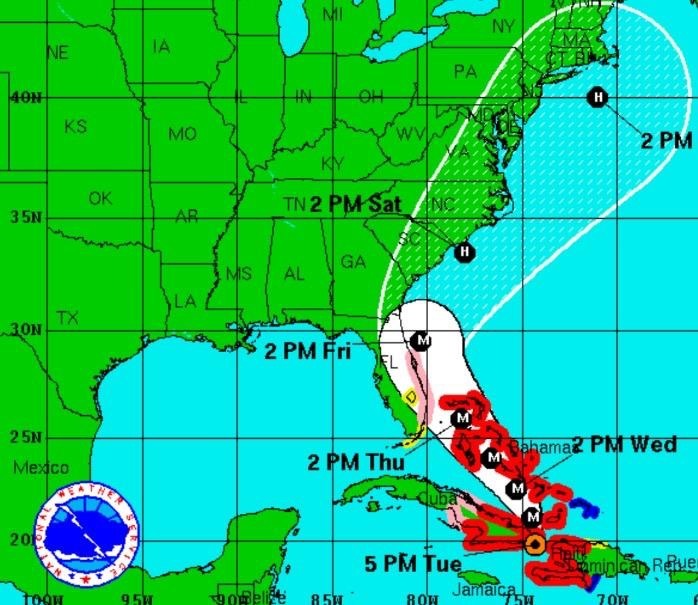 Until the day he arrived in southeast Florida, we were predicted to be exactly where he would make landfall with CAT 3 or higher winds and a storm surge, in the so called “cone of uncertainty.” At the last minute Matthew turned slightly east and we only got tropical storm force wind. We had no damage from the hurricane, however while putting the dodger (aka windshield) back on after the storm passed, the wind caught one panel and it fell to the deck and cracked. Fortunately we had the dodger made here in Stuart, so they were able to quickly replace that one panel for a mere $600. 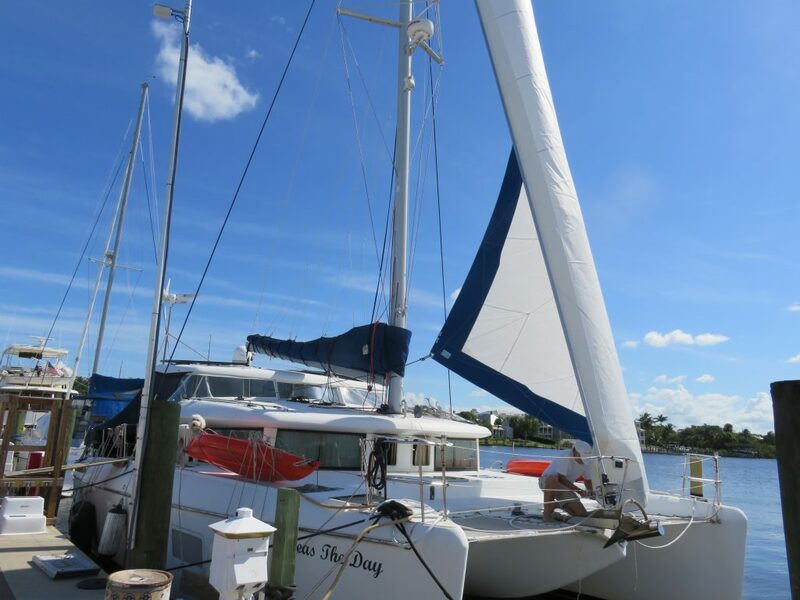 As the hurricane approached Florida, days and days of preparations began, including moving the boat to a more protected floating dock at the marina, removing everything from the deck and putting it inside the boat (including sails and two kayaks), and adding additional lines from the boat to the dock as well as more fenders to protect us from banging on the dock. The day before the hurricane hit Florida, we left the marina and stayed with friends Marilyn and Rich, who live nearby in Port St. Lucie. We were very grateful for their hospitality. 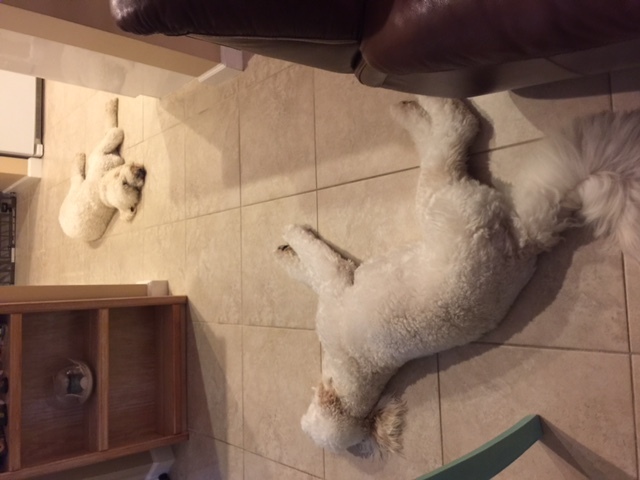 Their Goldendoodle Tater and Sailor, who share the same father, had fun playing together and we all slept through the hurricane. We then began the task of putting everything back where it was previously kept. One advantage, however, was it became an opportunity to give everything on the outside a good washing. All around the marina, most boats were being cleaned, not from the hurricane effects, but due to the relative ease of cleaning when there was nothing that had to be moved. As we were taking down the jib for the hurricane, we discovered it needed a few repairs and brought it to Mack Sails in Stuart. Surprise, surprise, we were told it was not worth repairing and we needed to buy a new one, which we did after the hurricane passed. 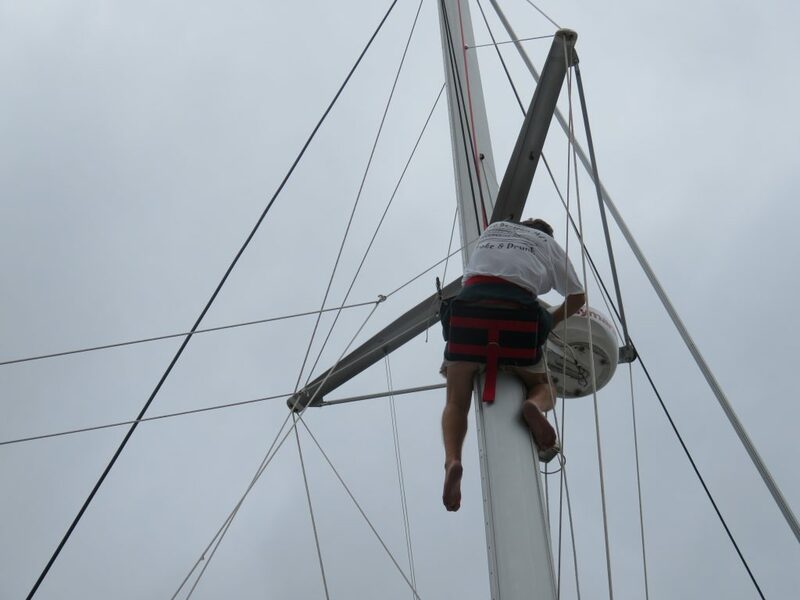 In the photo below, Mark is attaching the new sail. As soon as everything was put back, it was time to start preparing to leave. A big part of that is provisioning for a seven month cruise. Spreadsheets are made after determining what we need. For several weeks, I went shopping almost daily, bringing back bags full of provisions and then storing them. It’s not just food that has to be purchased and stored. We also buy paper products, toiletry items, cleaning supplies, office supplies and of course replacements for the many systems on the boat. If we use it, we buy plenty to take with us. Many items can be bought on Amazon or by mail order. Naturally this year I made sure I had plenty of hot chocolate and Sailor had abundant treats since we ran out of both of these last year. We get a new courtesy flag for the Bahamas every year, and we also had to get new paper charts for the Bahamas since ours were from 2008 and several revisions have been made since then. 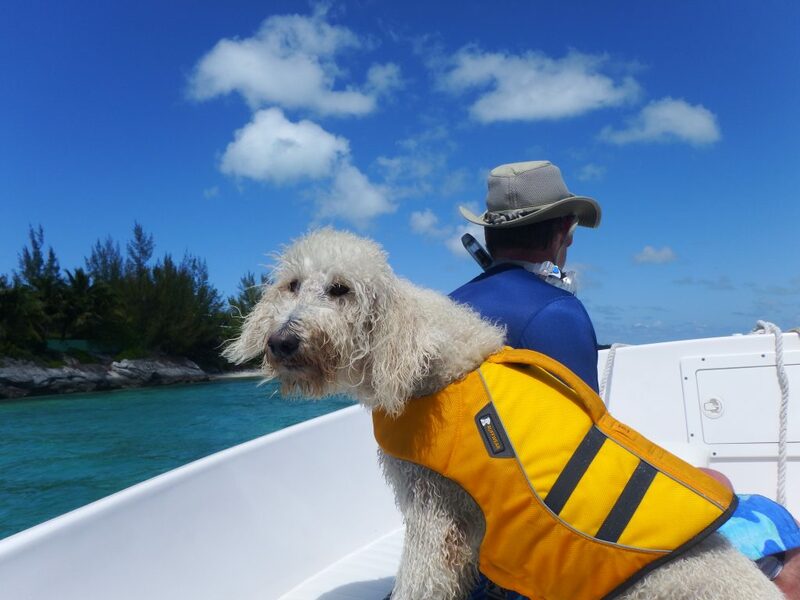 Of course we have a chart plotter with digital charts for the areas we travel in, but the Explorer Charts for the Bahamas are not available for our navigation system in digital format. Courtesy flags are not well made and rarely last a season so we have started buying two of the “premium” courtesy flags and are then able to have a flag flying for six months that isn’t shredded by the wind. We always bring an extra US flag too so we can replace it if it tears. This summer we bought an inflatable stand-up paddle board (iSUP) to add to our two kayaks for water exploring. 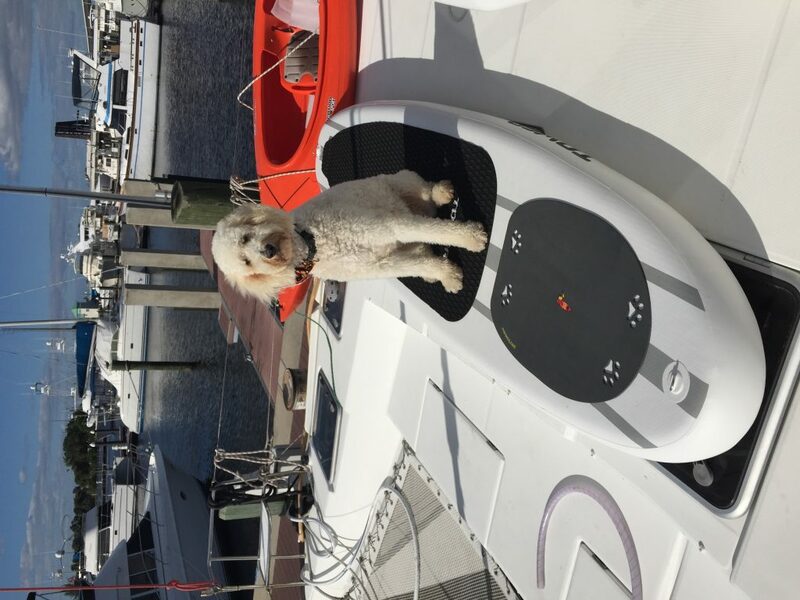 Sailor will now enjoy going with us on the iSUP. OK, I know the photo is sideways, but I can’t rotate it and we have deflated the board for storage so until we are in the water, this is the only one I have. Note the “pup deck” at the front for Sailor’s traction. 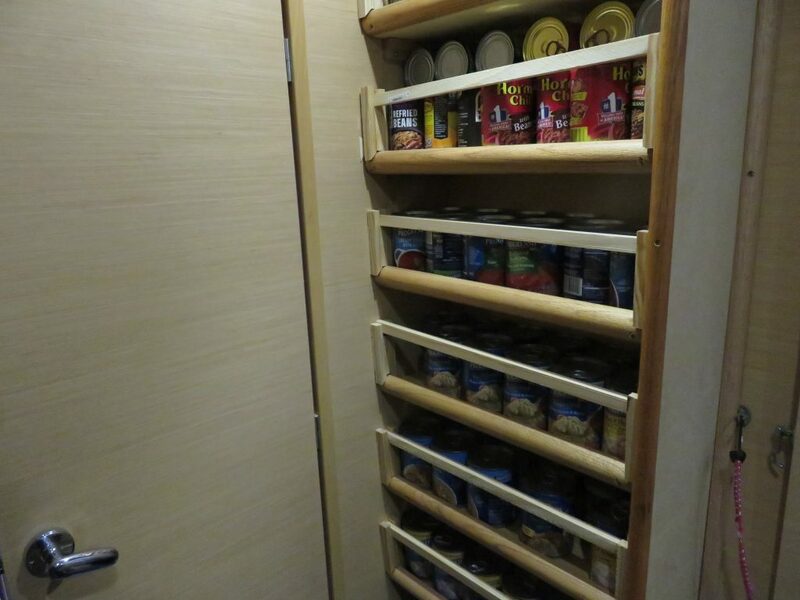 We have three queen size bed cabins and one is devoted to food storage when we cruise. Everything is placed in plastic containers, labeled and stacked. Catamarans are known for their storage, so cabinets are full as are the storage areas under the salon couch and bench. 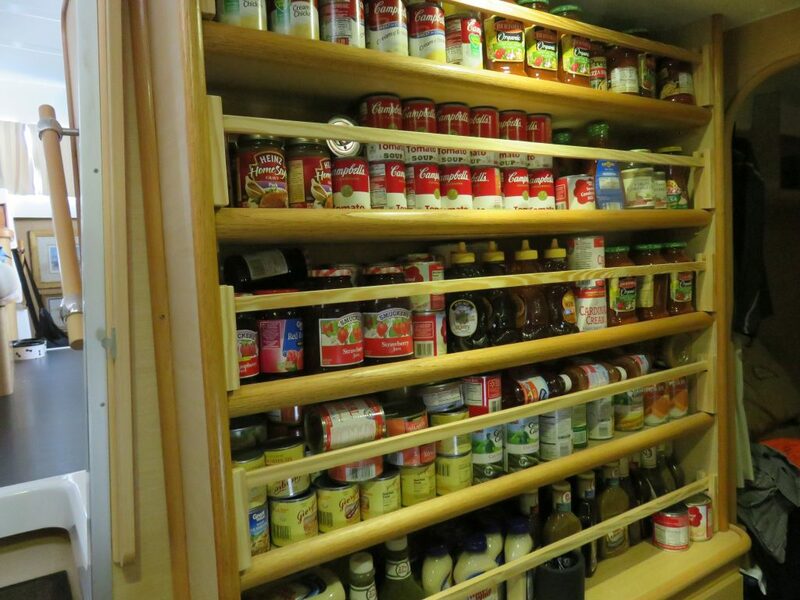 The bookshelves Mark built in the office became a pantry after we bought Kindles and gave away most of our books. We have deep storage lockers on the foredeck and under beds there is more space for storage. Under one bed we have four large bags of dog food, many cases of Coke for Mark and other miscellaneous items. Of course the freezer is full as are our two refrigerators, one in the cockpit and one in the galley. Before we leave Miami, we’ll get fresh fruit and vegetables and again when we stop in Nassau we’ll restock what we need at a fantastic, but expensive, Fresh Food Market. The next good grocery store we will be near is when we reach Georgetown. The grocery stores in the small islands of the Exumas are usually a few shelves in someone’s house. They are stocked once a week when the supply boat arrives from Nassau with items from the States. The storage locker below is one of several on the foredeck. It is just under five feet deep and is full of paper products which are ridiculously expensive in the Bahamas. Yes, we probably buy more than we need and it does add a lot of weight to the boat. Just today someone watched me bringing supplies aboard and said, “They do have groceries in the Bahamas you know.” Yes, I know that, but what if I want a certain brand of peanut butter and don’t want to pay twice the price I got it for at Sam’s, Walmart, or Target or it isn’t even available where there is limited stock? What if I need rechargeable batteries and can’t find them in the Bahamas? What if I use a certain brand of face lotion and I can’t get it there? A one gallon container of Rotella engine oil is $12.97 at Walmart and $53 at a NAPA store in Georgetown. However, in most cases it’s really not about money. It’s about choice, and we choose to eat and use the brands we like. The fact that we save money is an added benefit. The fact that we have a boat with a lot of storage available makes it possible. Another thing we have to provision for is our meds. Mark takes several prescriptions and I am on thyroid medication. Luckily, I can buy a three month supply, without using insurance, for $10 at Walmart and they have no problem if I get six months for $20 or even a year at a time, as long as it is on the prescription. Mark, on the other hand, has a huge problem getting what the insurance companies call a “three month vacation waiver.” It’s fine with the doctor and OK with the pharmacy but it is pulling teeth to get the insurance approval. In the end, after weeks of sending in forms, numerous phone calls, and much waiting, he gets them. This year it was particularly difficult. It’s hard to explain to someone that you don’t have a cruise ship itinerary to send them, or a receipt for a tour in Europe to prove you are going to be out of the country. They don’t understand that we can’t go to a pharmacy when we cruise, although there is one in Georgetown and also in Spanish Wells. 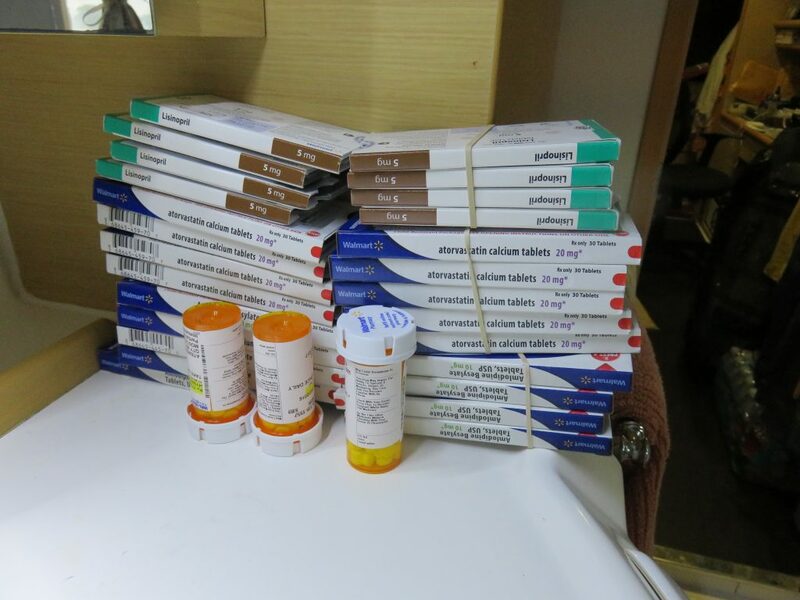 One year I ran out of thyroid medication and purchased some at the pharmacy in Spanish Wells. I recall it was quite a bit more expensive, although that may not be true in all cases. After calling every day for over a week, and spending four hours on the phone last Friday, today Mark finally got a call saying his Medicare provider had approved it. That’s fine, but we had actually planned on leaving yesterday and this afternoon our car is going into storage. So at 2:30 today he picked up the last of his meds and now has a seven month supply. As we do all of this, we are also watching the weather. 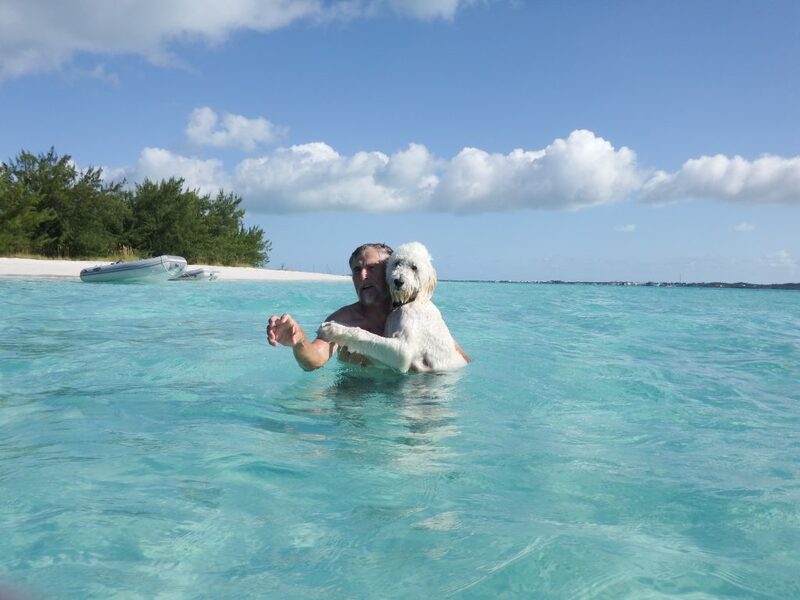 We subscribe to marine weatherman Chris Parker and get daily email updates on sea conditions in the US and Bahamas. We can also listen to his morning weather reports for the US, the Bahamas, and the Caribbean, broadcast on SSB and webcast. Our route when we leave takes us from Stuart to Lake Worth on the ICW. Then we have two days on the ocean, first to Ft. Lauderdale and then on to Miami. This means we have to wait for two days where the ocean is fairly calm and wind is in a favorable direction for sailing or at least not on the nose. Once we arrive in Miami the wait begins again for “crossing weather.” Chris Parker has reliable stats and recommendations for crossing the Gulf Stream to the Bahamas. It is about 50 miles on the ocean from Miami to Bimini where we check into the Bahamas. The route is complicated by passing through the Gulf Stream where seas can be huge if the wind is from the north and meets the Gulf Stream which is a strong current flowing north up the US East Coast. There are many weather sites we can check but invariably our best source is Chris Parker’s crossing forecast. 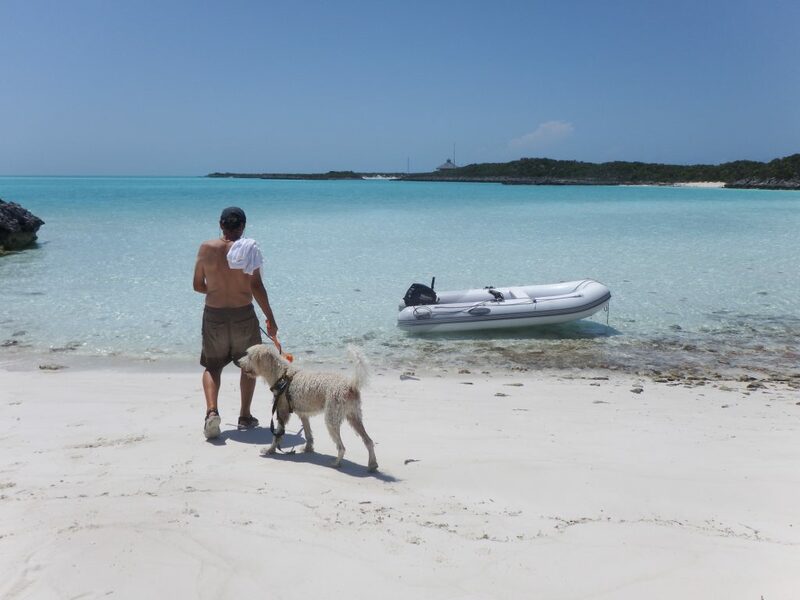 It usually takes us about eight hours of motorsailing to get from Miami to Bimini. To follow our cruising route, there is a link in the menu at the top of our website page. It is under “Location” and called “Spot Tracking.” Whenever we are moving it is turned on, updating our position every ten minutes. I tend to post photos and updates more often to my Facebook page than to this website and there is a link to that at the top of the right column on the Seas the Day website. We plan to leave Sunset Bay midmorning on Wednesday (tomorrow) and take the ICW to Lake Worth/Palm Beach. It’s an easy motor with quite a few bridges that have to open for us, but all timed well. We have reservations at a marina in Ft. Lauderdale for Thursday and Friday night, in case we want to wait until Saturday to go on to Miami. 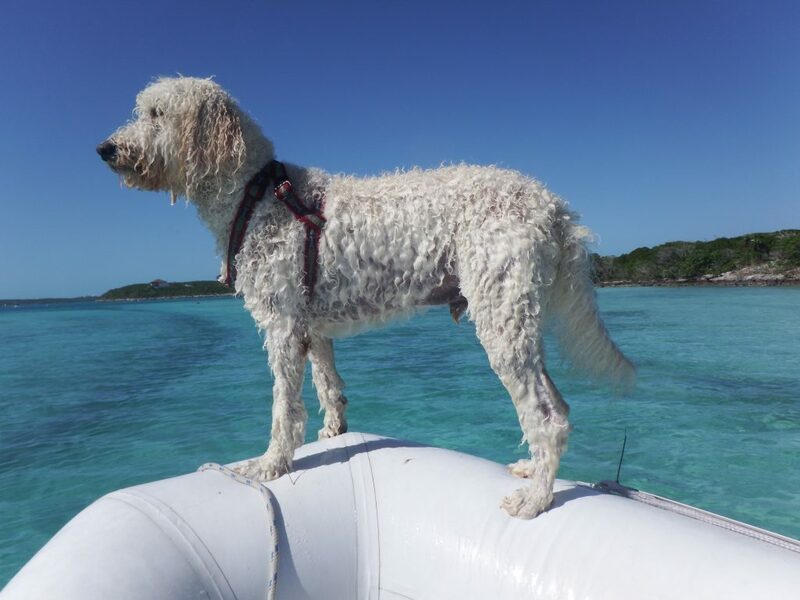 This entry was posted in 2016-2017 Bahamas Cruise, Living on a Boat, Provisioning, Sunset Bay Marina and tagged Boat Repairs, Ft. Lauderdale, Goldendoodle, Hurricane Matthew, Lake Worth, Miami, Stuart, Sunset Bay Marina, Weather on November 8, 2016 by Jan.
For the last several weeks I have shopped at numerous stores and spent many hundreds of dollars to provision for the next five months until we return to Stuart in June. This is a monumental job, and one I avoided for as long as possible. 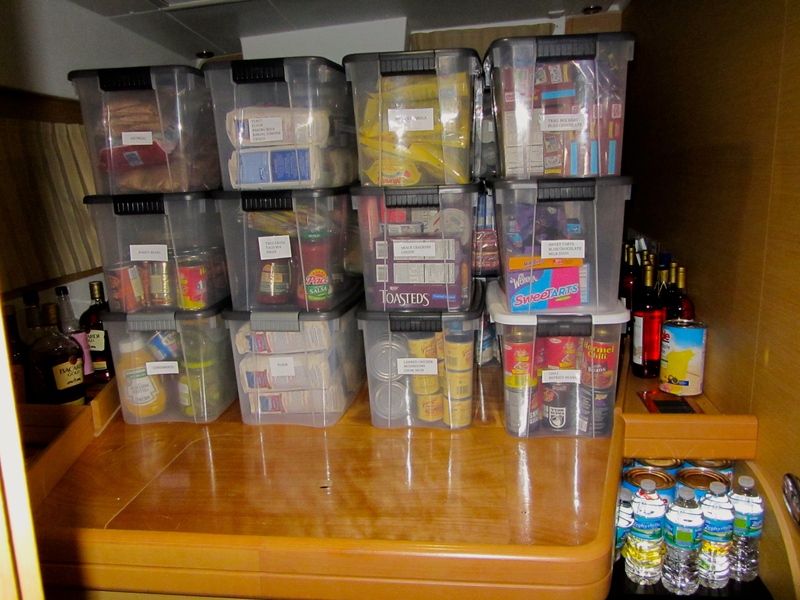 I always tend to overbuy, which is OK except the provisions use up a lot of space on the boat and if we don’t watch carefully, expiration dates arrive before we use everything. Also, I’ve learned from bitter experience that if we don’t eat it in the States, we won’t eat it while cruising. The first year we brought numerous items we thought we’d use and ended up giving them away when we returned to the States. 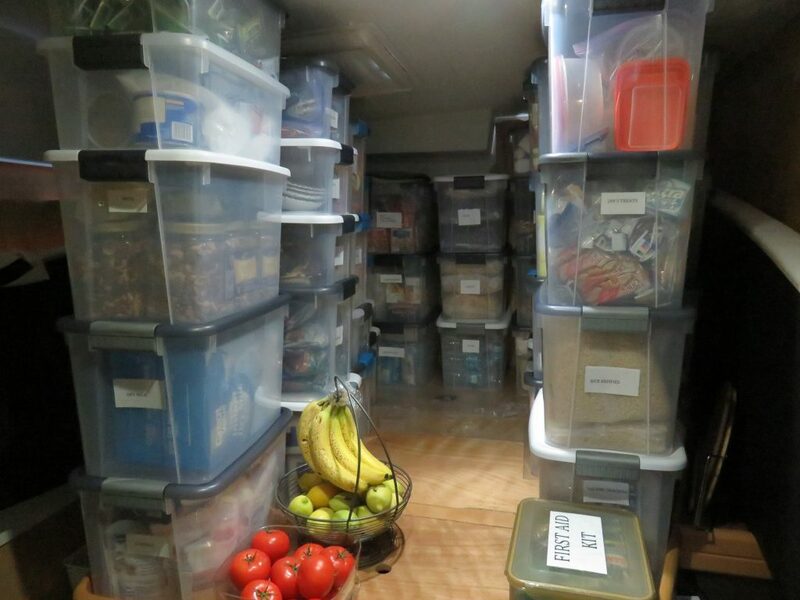 After purchasing the food, I organized it by type and put it into 30 gallon Sterite plastic boxes. We removed all the bedding from the aft cabin and placed the 40 boxes on the platform for the queen size bed. The boxes are stacked three high and labeled. So we don’t have to push all the boxes around to find what we need for a meal, we have a chart that shows where each box is located. The red is the top box, the green is the middle box and the black is the bottom box. There are four rows of boxes, five wide in the back and then four and three wide. 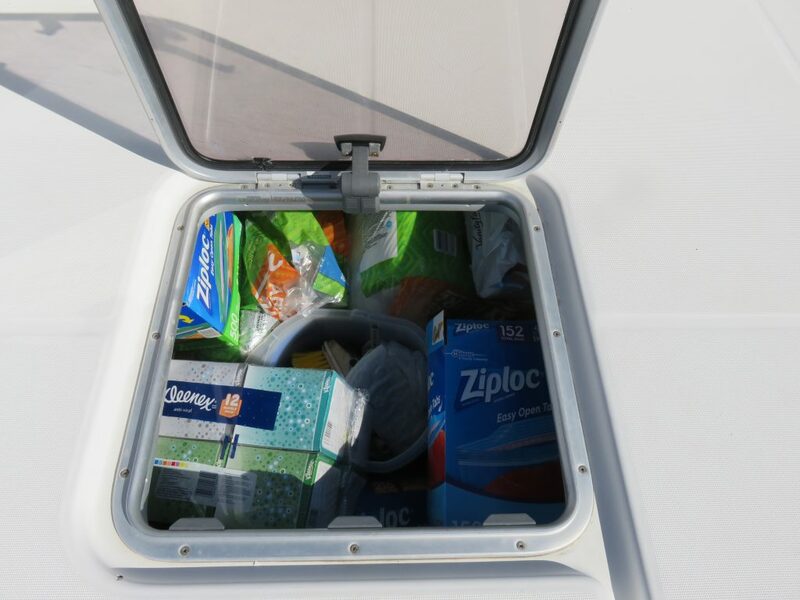 Of course, we have other items stored in different areas of the boat, including very large storage lockers on the foredeck where we store nonfood items, like paper towels, toilet paper, laundrey detergent, etc. We store bags of dog food and other items under one of the beds. There are a lot of cabinets in the galley and salon, including storage under the benches. Since we don’t need all three bathrooms, two are used for storage. We have two refrigerators and a large freezer which are all full. The frozen food is all stored in Food Saver bags and organized on each shelf so we can find things without pulling everything out. To say the least, I am sick of shopping. Every day for these two weeks I went shopping and returned with the SUV full of items which had to be loaded onto a dock cart (or two), rolled to the boat, unloaded, unpacked, and stored. 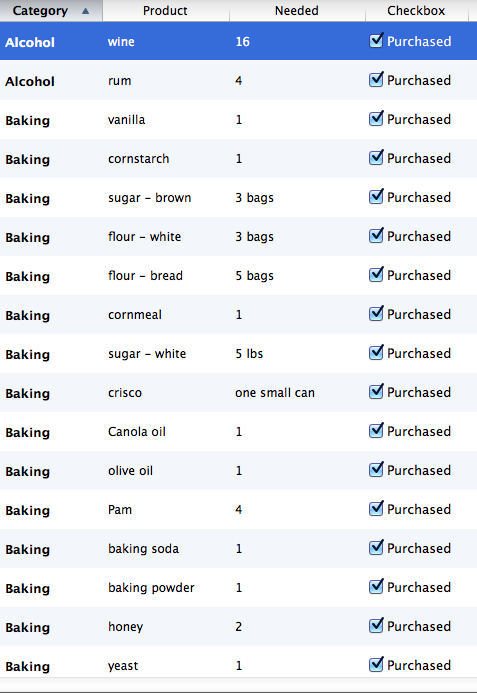 I actually started some provisioning throughout the summer and fall, especially ordering items online. Food was saved for these last two weeks. I had a good reason for doing the provisioning now because tomorrow I fly to Bethesda, Maryland, where my son Peter is having surgery to remove a benign tumor on his spine. After a week in the hospital we will fly to his house in Oceano, California, near Pismo Beach, and I’ll stay with him while he recovers. My ticket to return to Florida is on February 6, which could be changed if he needs me to stay longer. Everything on the boat should be ready to go when I get back and we’ll leave for Miami on the 8th. Mark still has a few small projects to complete but the big installations are done. This entry was posted in Provisioning and tagged Provisioning, Stuart on January 14, 2014 by Jan. Since we are within a month of (hopefully) beginning our 2013-14 cruise to the Bahamas, our blog entries will start focusing on preparations and destinations. 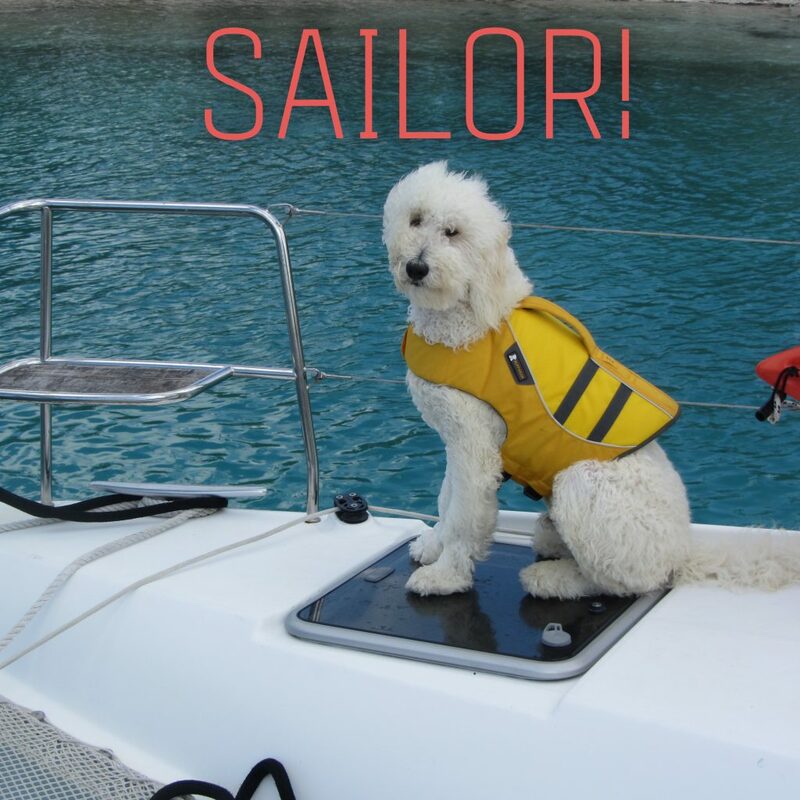 Therefore I have added a new page under the “Sailor” section of the menu called “Sailor’s Adventures” where the boat dog information will be located. The first entry there is about what we did today, with a short description below. Every year, shortly after Halloween, the “no kill” Humane Society of The Treasure Coast, located in nearby Palm City, holds a fundraiser in Stuart. 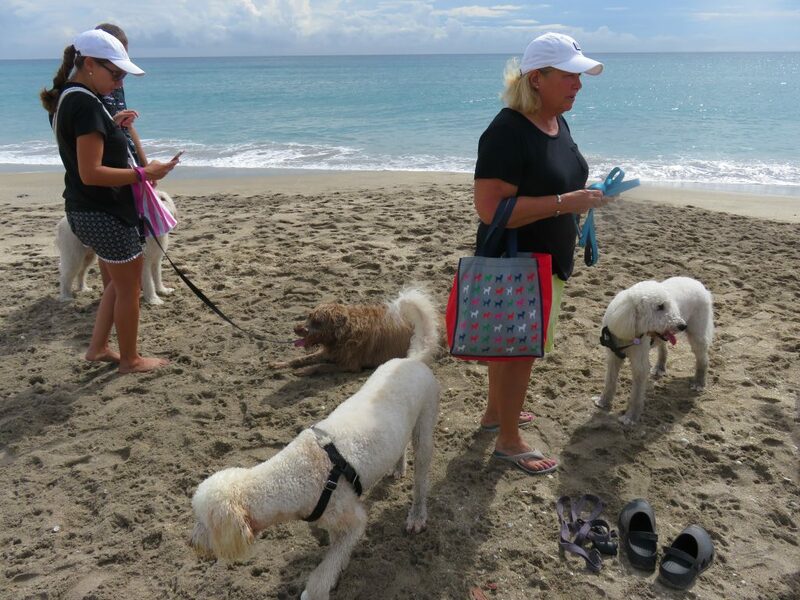 Called the “Mutt March,” people pay to enter their dogs in the festivities and buy tickets for a raffle. The dogs come dressed in costumes, participating in a parade and a variety of fun events. More details can be found in the “Sailor” section of this site, located here. The photo below is one of the winners of the costume contest. 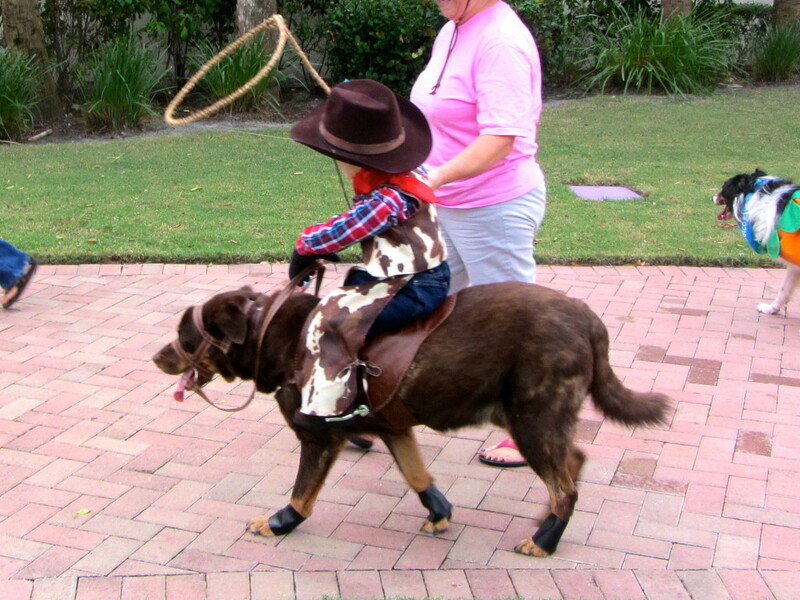 Walking behind them, I actually thought a real little boy dressed like a cowboy was riding this dog. Very clever costume and very gullible me! 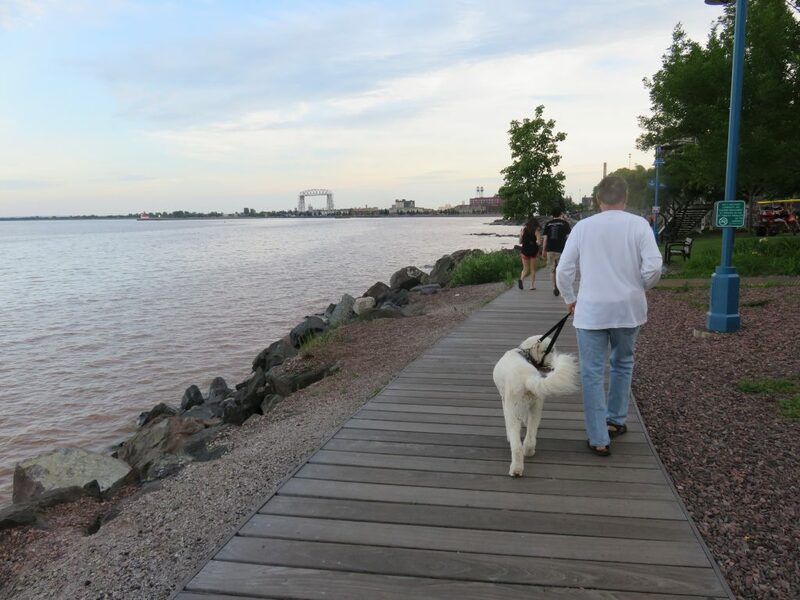 This entry was posted in Boat Dog, Sailor Doodle, Stuart and tagged Sailor, Stuart on November 9, 2013 by Jan.
Mark and I grew up in Duluth, Minnesota and their forecast for the next two weeks is snow with lows in the 20’s. It appears they might get an early winter this year. Seasons in Florida are changing too. When we first moved aboard the boat five years ago we were getting a car to rent and were picked up by a Hertz employee. While talking to him about the weather he informed us that, “There are two seasons in Florida……hot and damn hot.” We are now entering the “hot” season, with “damn hot” hopefully almost over. 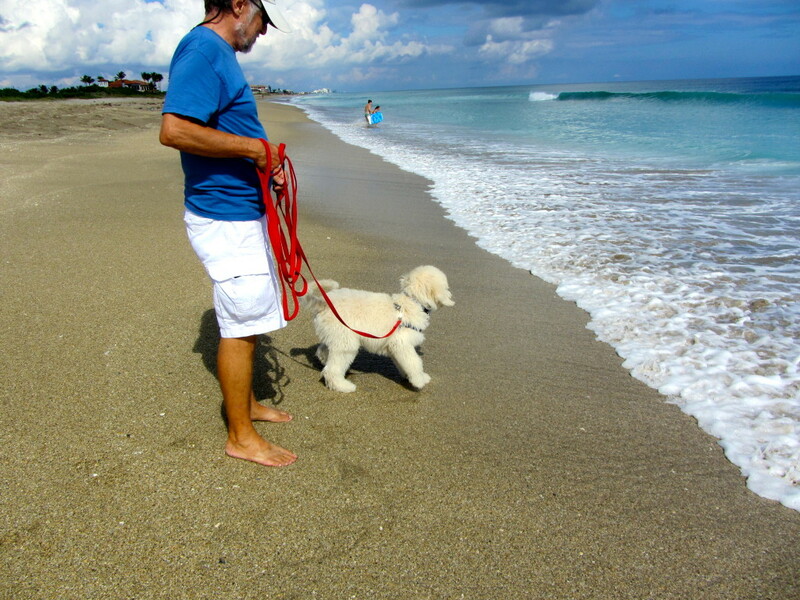 Today seemed like a good day to take Sailor for his first beach walk. 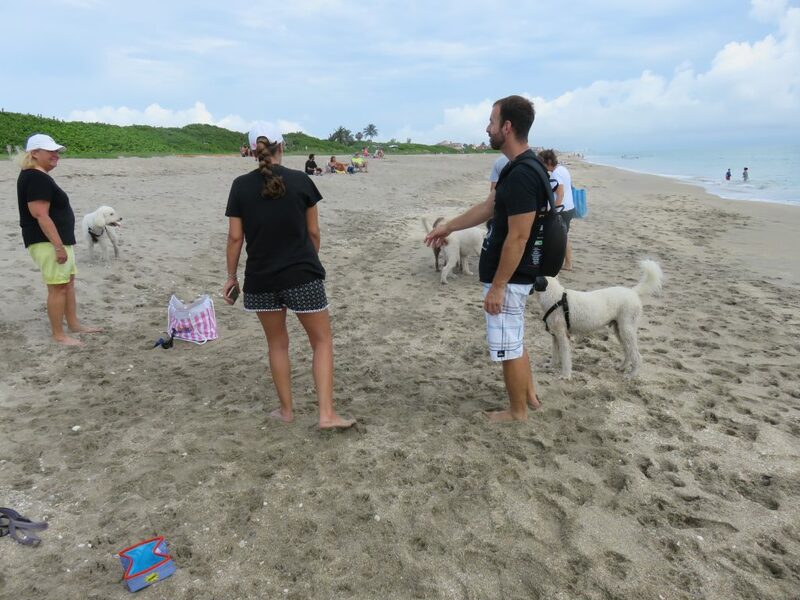 Unlike Ft. Lauderdale and Miami, almost all the beaches in this part of Florida allow dogs and there are a number of designated “dog beaches” where they can go off leash. 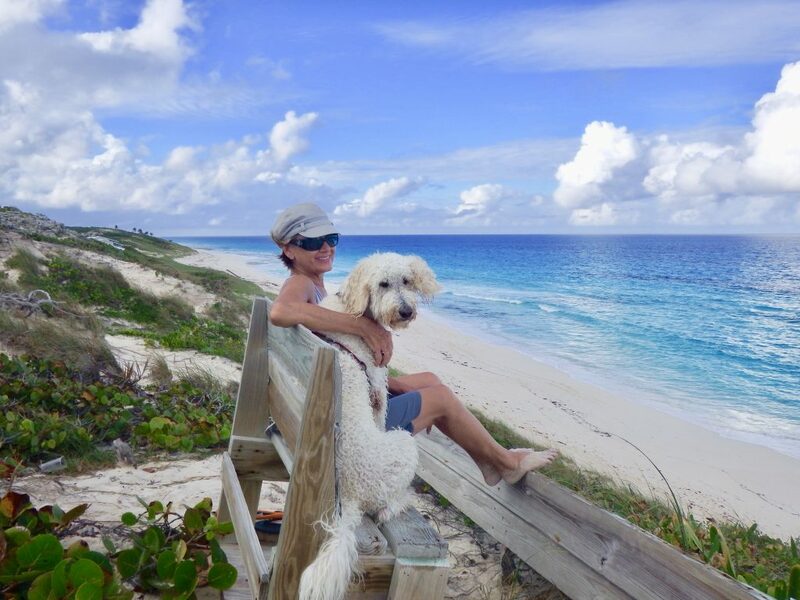 Stuart Beach is just six miles from the marina. 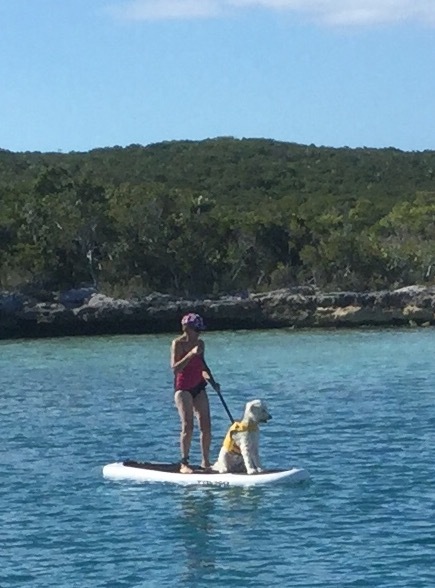 After we parked and made our way towards the water, Sailor seemed quite interested. 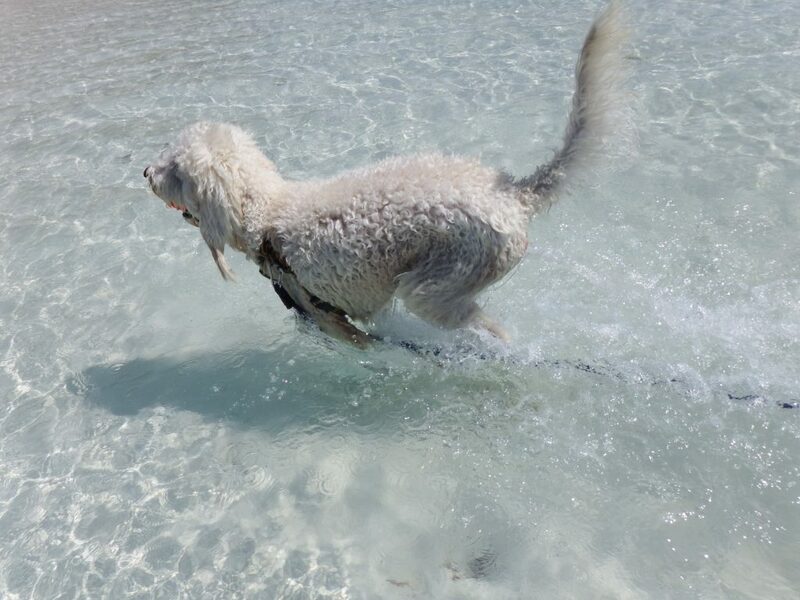 He had never walked in sand before and on the wide beach that’s about all he saw at first. 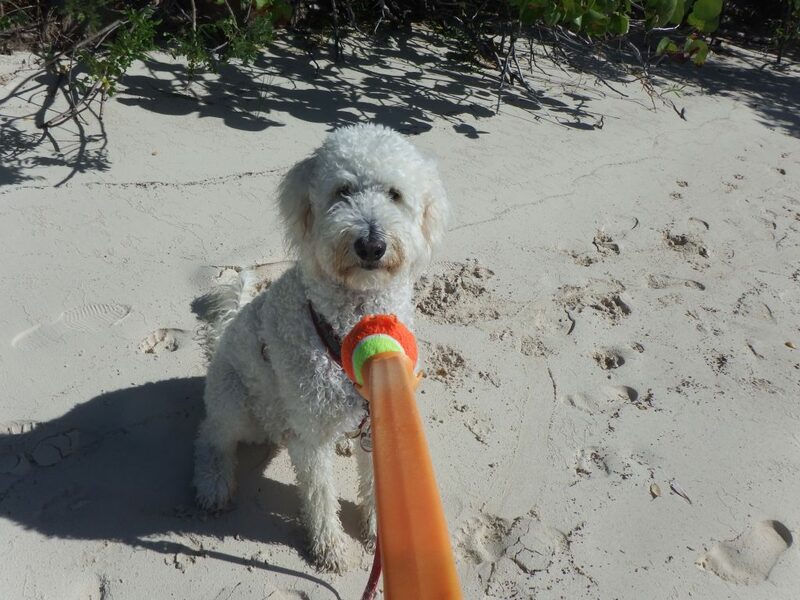 He was straining, obviously wanting to run across the sand, but we had no intention of removing his leash. For his first ocean beach experience, we probably should have gone to nearby Bathtub Beach, where there is a reef that keeps the waves off shore. Unfortunately, today the waves on Stuart Beach were a bit high and the tide was coming in. We connected a long training leash to his harness and waited to see his reaction. 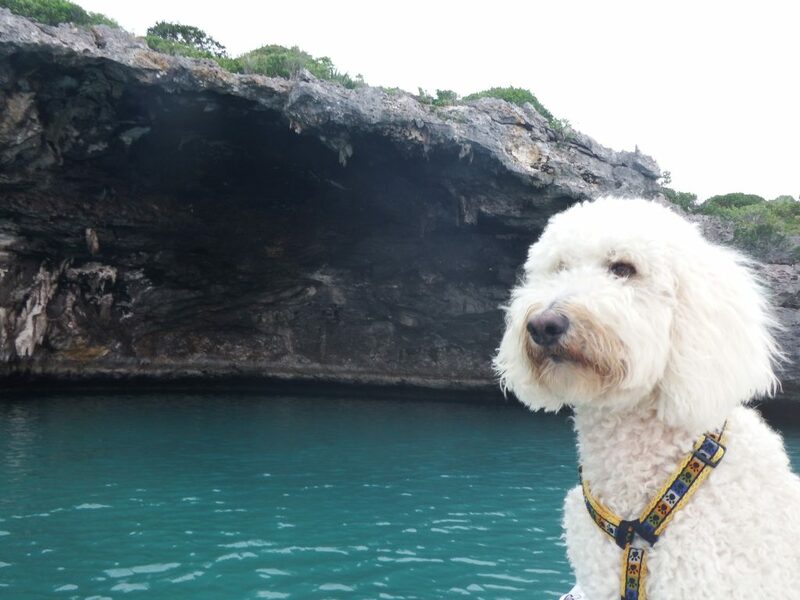 Sailor is always curious about new things and he stood at the edge of the water looking out at the ocean, not knowing that the edge would soon change. And then it did and he wasn’t quite so curious anymore. 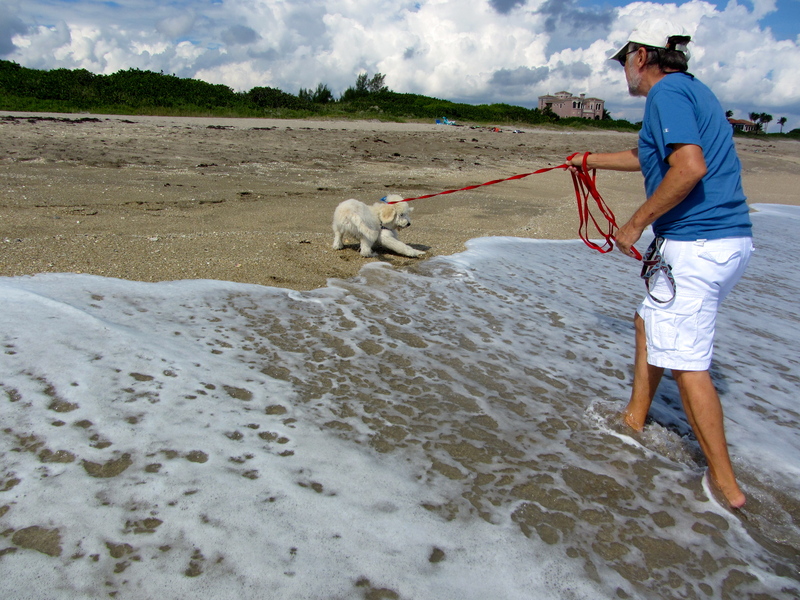 As the water came towards him, Sailor ran backwards while Mark let out some of the leash. Not wanting to scare him, we walked along the beach for awhile staying away from the water’s edge. 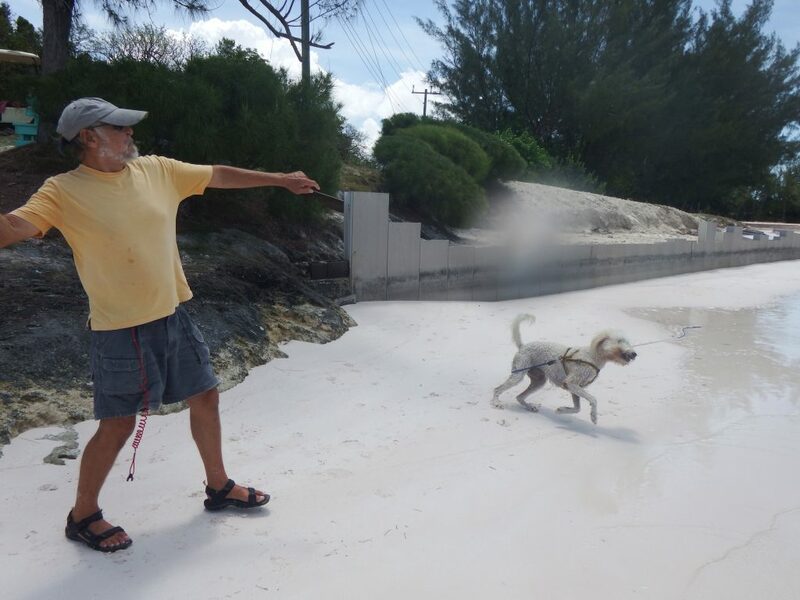 Eventually, two off leash dogs came by and Sailor got curious again. They played for a little while and then the dogs continued their walk. 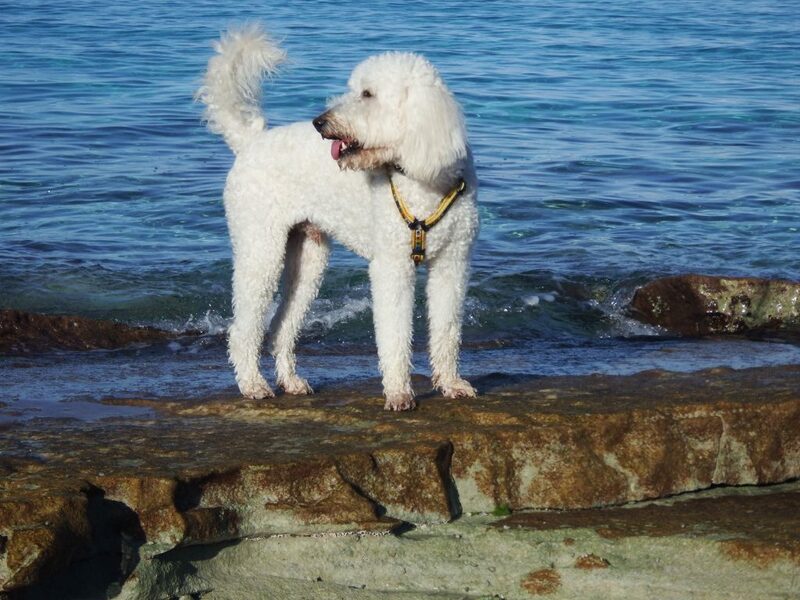 Daisy’s first beach experience was along the coast of Lake Superior and those waves scared her. 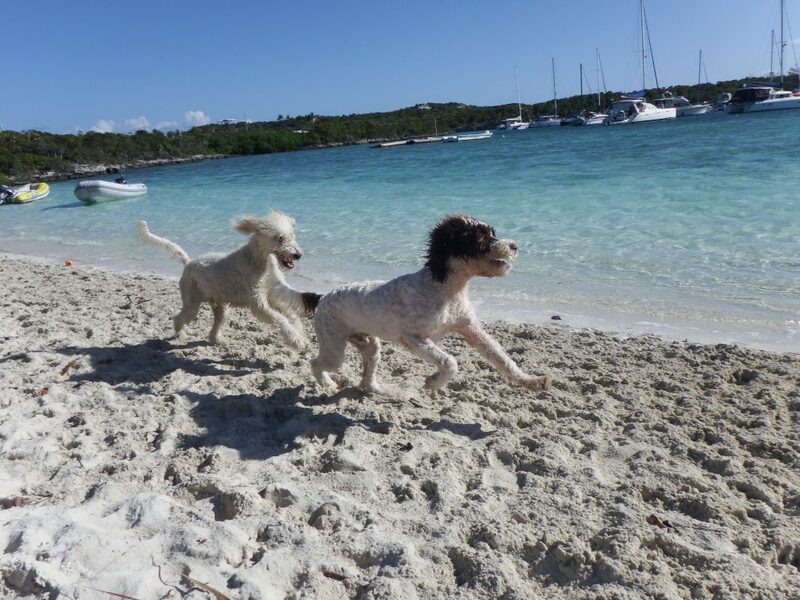 Eventually, she learned to love walking on the beach and I’m sure Sailor will too. He has a lot of them in his future. 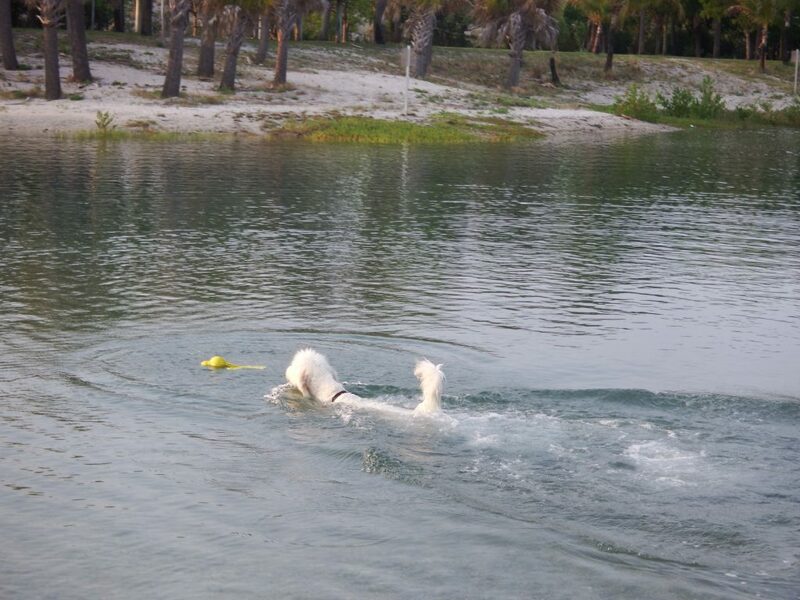 This entry was posted in Beach, Florida, Sailor Doodle, Stuart and tagged Sailor, Stuart on October 20, 2013 by Jan. Sailor had his last puppy shots on Wednesday and on Saturday we decided to take him out to dinner with us and then to his first visit to the Stuart Bark Park. Below, Sailor waited for Mark to set up his ramp. 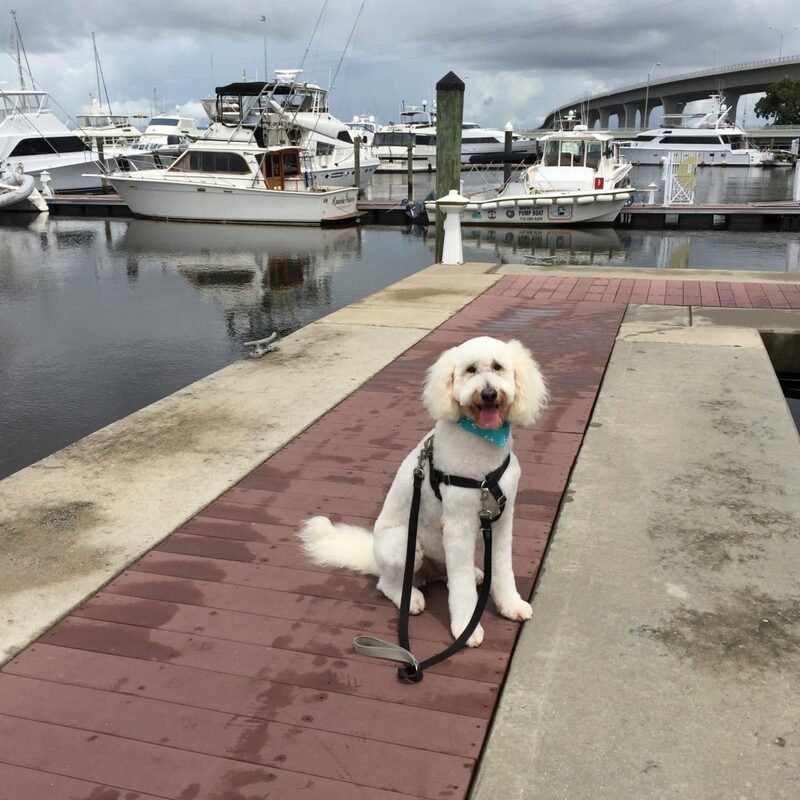 He always sits patiently until we say “OK” and then he is allowed to walk down the ramp to the dock below. 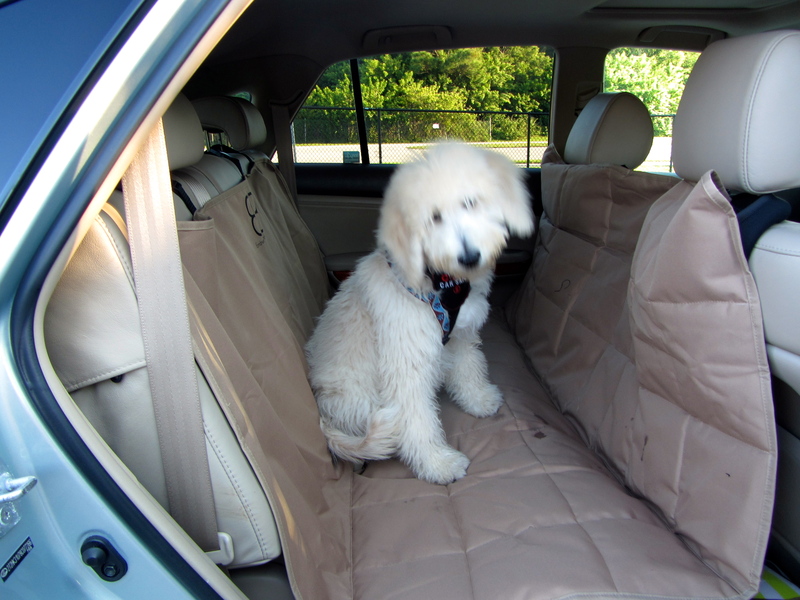 During previous car rides, Sailor has been a bit unsteady sitting or standing on the back seat. We bought him a “hammock” and this was his first ride in it. There are openings for seat belts, therefore he can still have his seat belt harness locked in. Yes, he is getting bigger and can now see out the car windows. He weighed 23 pounds at his vet visit on Wednesday. This was his third visit to Toojay’s and once again he behaved perfectly. He slept under the table while we ate and when we were finished he sat and waited while we got ready to leave. 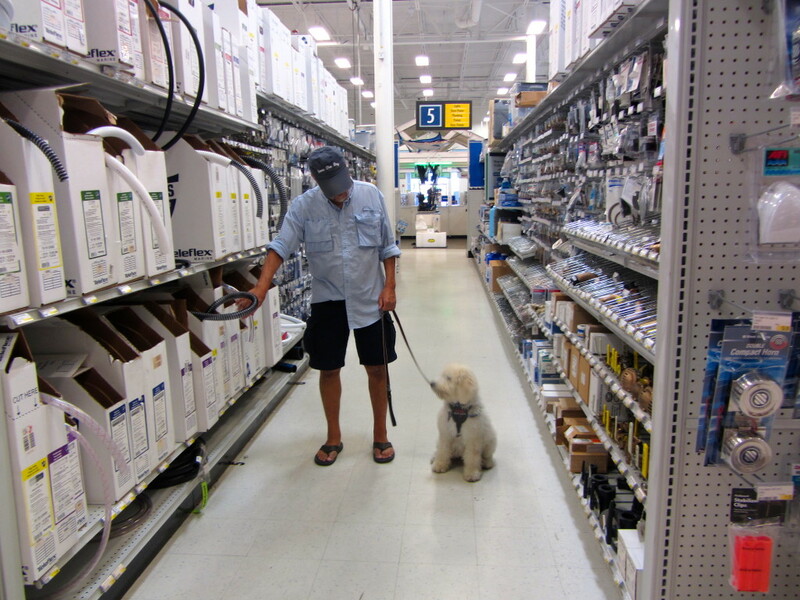 After dinner, we walked next door to West Marine to buy some hose for our new washdown pump. 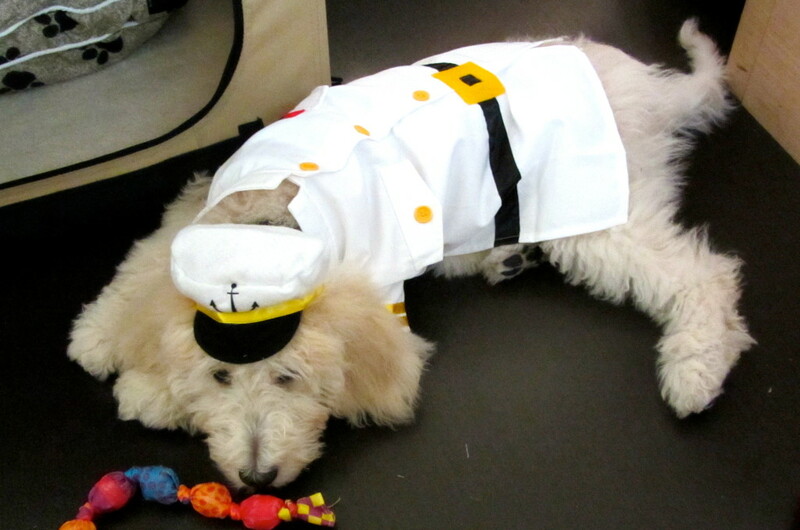 West Marine allows dogs in the store, especially ones as well behaved as Sailor. More fun was in store for Sailor on Sunday. 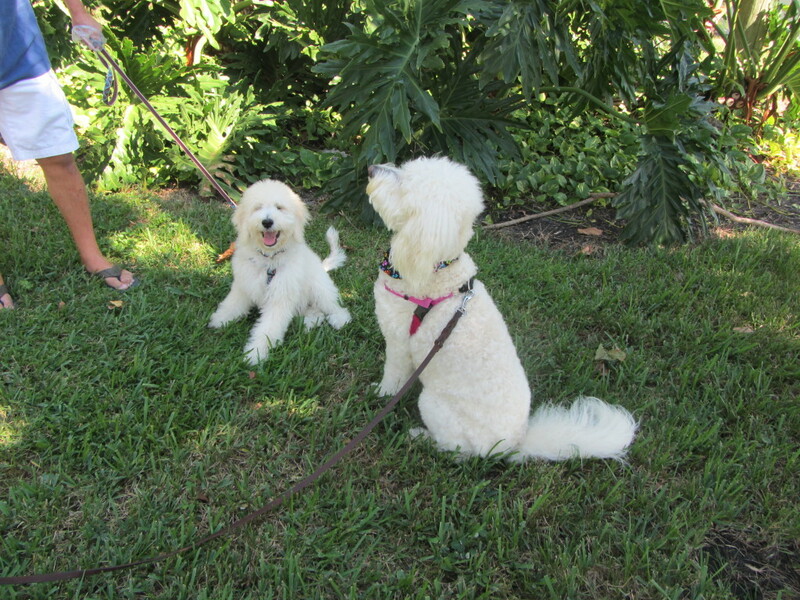 We had been in contact with another Moss Creek Goldendoodle family who live near us in Palm City. 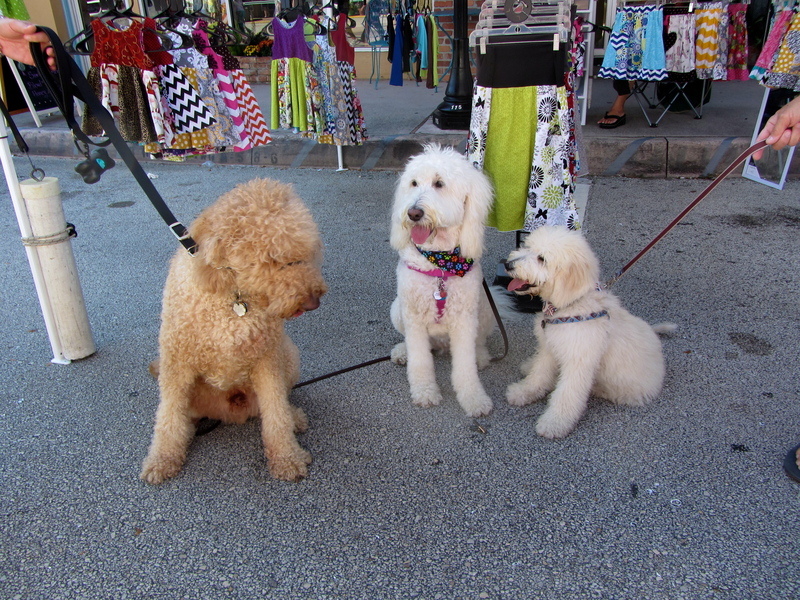 We met Marilynn, Ray, and Smoochie at the Downtown Stuart Craft Show, a short walk from the marina. 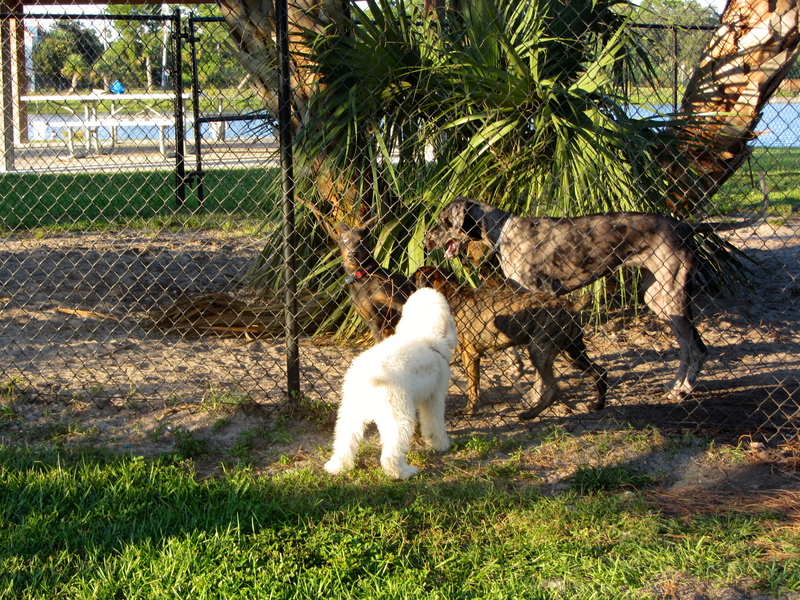 Smoochie is the sister of Sailor’s father, Bentley, so today he met his aunt. It took a long time to walk through the show because we had to stop every few feet for people to admire and ask questions about Smoochie and Sailor (aka Mini-Me). We met quite a few other dogs, including several Goldendoodles. One, named Max, turned out to be another “relative” from Moss Creek. 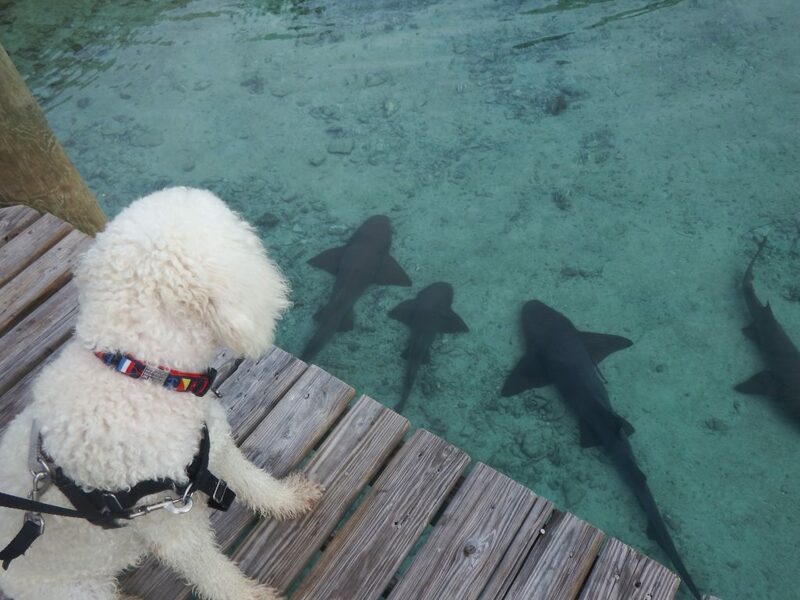 Stuart is a very dog friendly town. 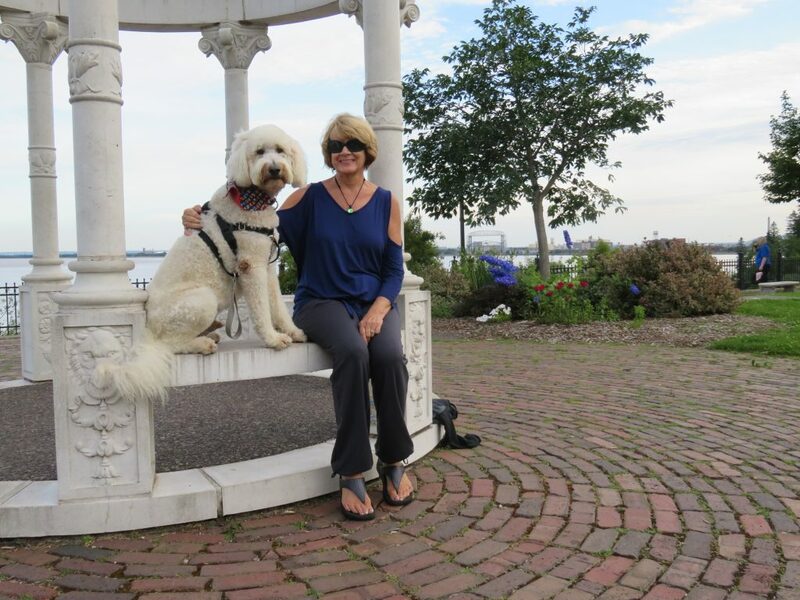 We met in the park near the marina and Aunt Smoochie had to explain to Sailor, with a few barks, that she wasn’t interested in puppy play. Eventually they calmed down for a picture and we walked to the craft show. One of the dogs we met at the fair was another Moss Creek Goldendoodle named Max. By next summer, Sailor will be the size of Max who is much bigger than he appears in this picture. After a fun time, and four new scarves for Sailor purchased from one of the venders, we headed back on the boardwalk. When we got to the boat, an exhausted Sailor slept for the rest of the day. 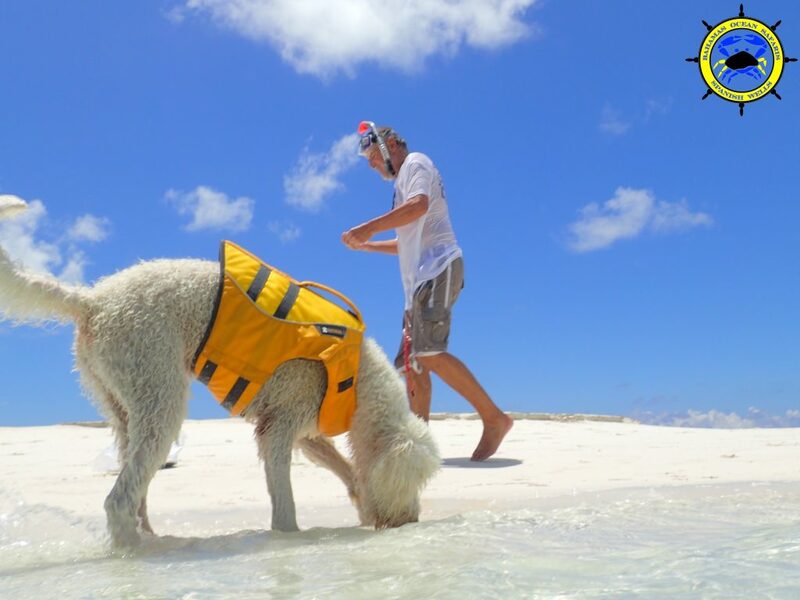 As a boat dog, Sailor will be meeting many new people as well as lots of dogs, and this weekend he showed us that he is up for the challenge. 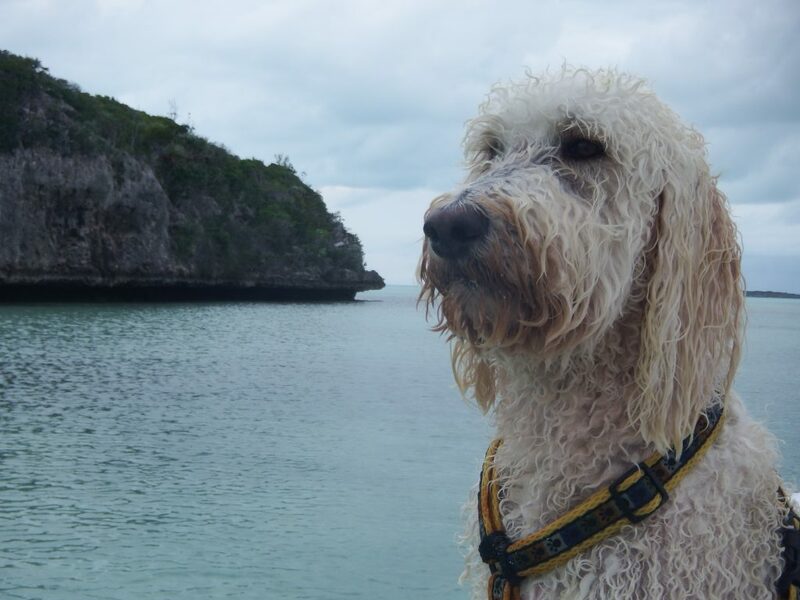 This entry was posted in Boat Dog, Sailor Doodle, Stuart and tagged Goldendoodle, Sailor, Stuart on October 13, 2013 by Jan.
During our first five years aboard Seas the Day, our precious Goldendoodle Daisy visited hundreds of beaches from South Padre Island, TX along the Gulf Coast and the Gulf Intracoastal, the entire east and west coasts of Florida, from Florida to Charleston, SC and along Lake Superior from Duluth to Canada. We hope to take a photo of every beach Sailor walks on and post them here. 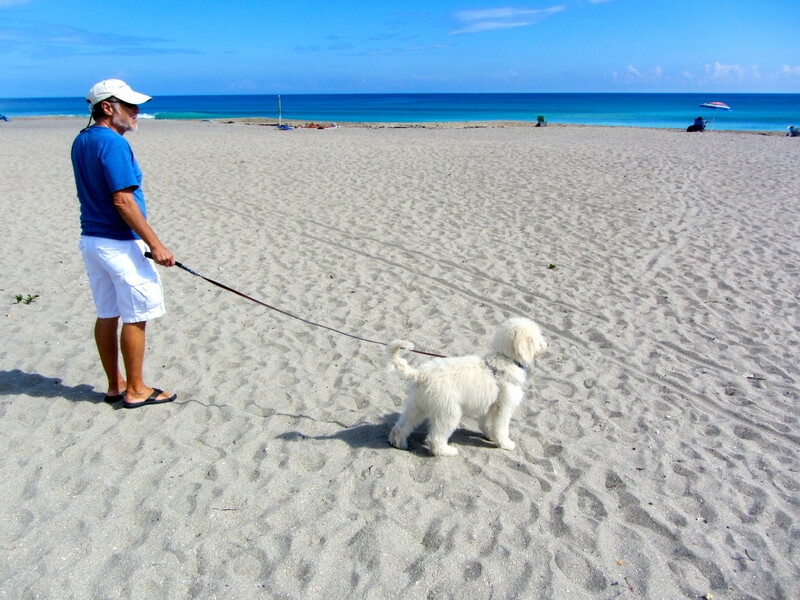 Sailor had his first walk on the beach on Hutchinson Island, near Stuart. 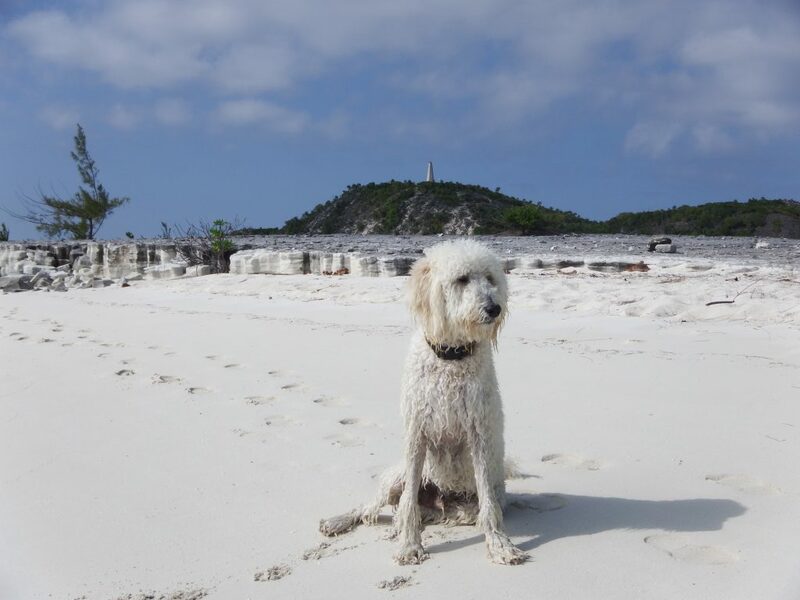 The area is a designated dog beach, but we did not let him off leash. At first he was curious about the sand and water, but when the waves crashed up on the shore, he pulled away. We walked away from the water’s edge for awhile, but he resisted venturing near the water again. 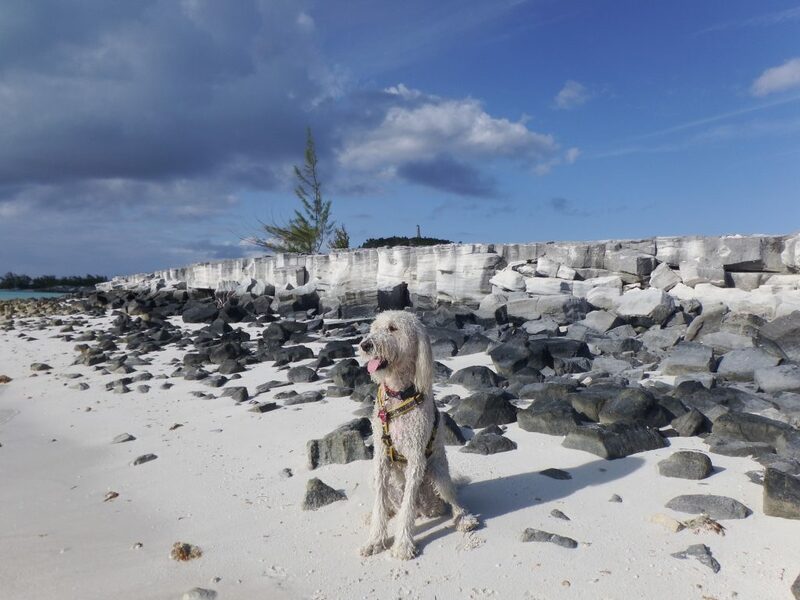 More about Sailor’s first walk on a beach is here. This entry was posted in and tagged Stuart on September 30, 2013 by Jan.
We are using the Garmin inReach satellite system to show where we are located. This is the link that brings up a map and marks our exact location. If you click on the “+” icon, the map will show exactly where we are located in a more detailed map. When we are on the move, inReach tracks our progress, updating our position every ten minutes until we reach our destination for the day. Usually it will include a message telling about that part of our destination. From June through November we are at Sunset Bay Marina in Stuart, FL. 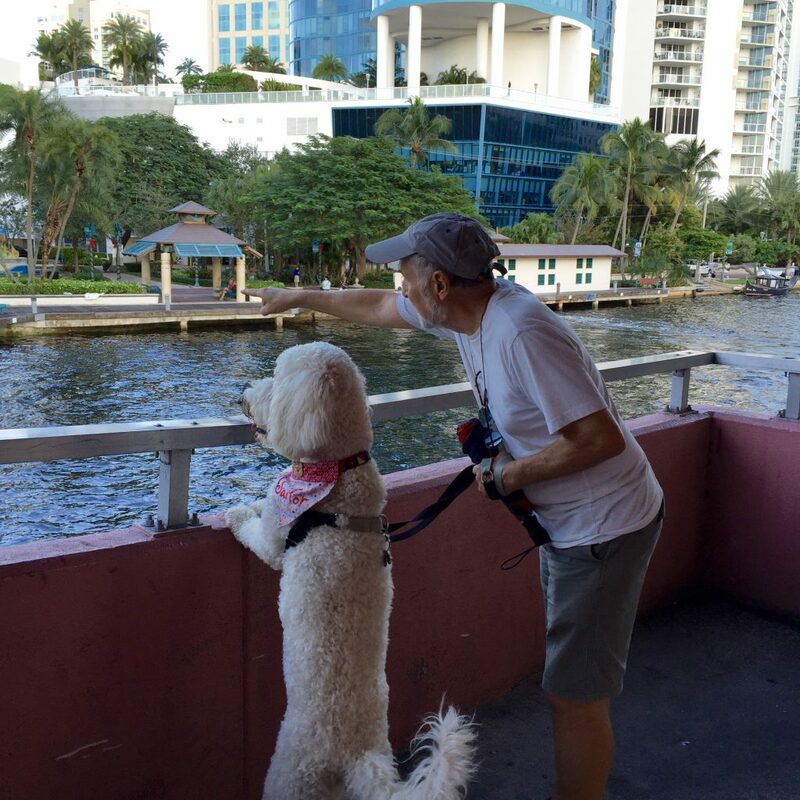 We love this town and the marina. The people are very friendly and everything we need is within five miles, without ever going on an Interstate. We feel like we are living in a condo on (and in) the water when we are in Stuart. From December through the end of May we are cruising in The Bahamas. 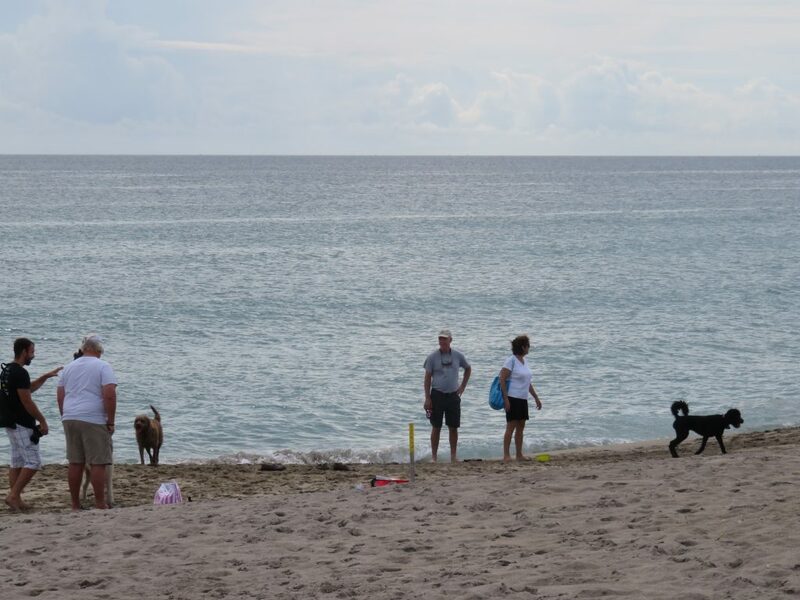 We leave Stuart, make stops in Lake Worth and Ft. Lauderdale, then on to Miami where we wait for good crossing weather. 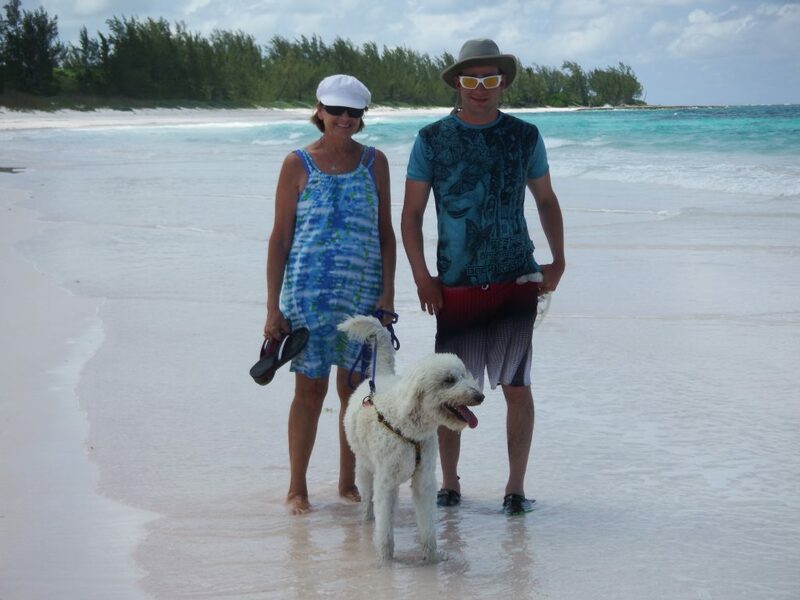 We check in at Bimini and from there continue to the Exumas, stopping at various small islands on our way south. 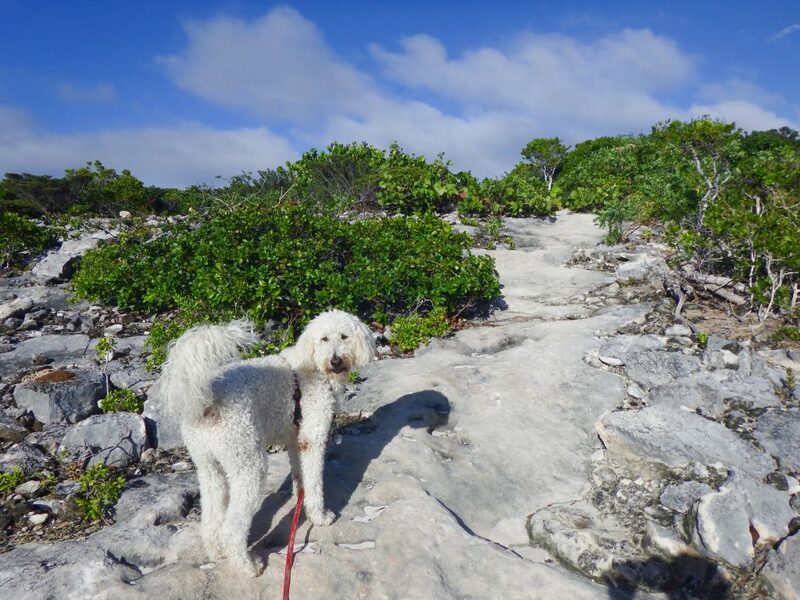 We sail north in the spring through Eleuthera to Spanish Wells and back to Stuart. 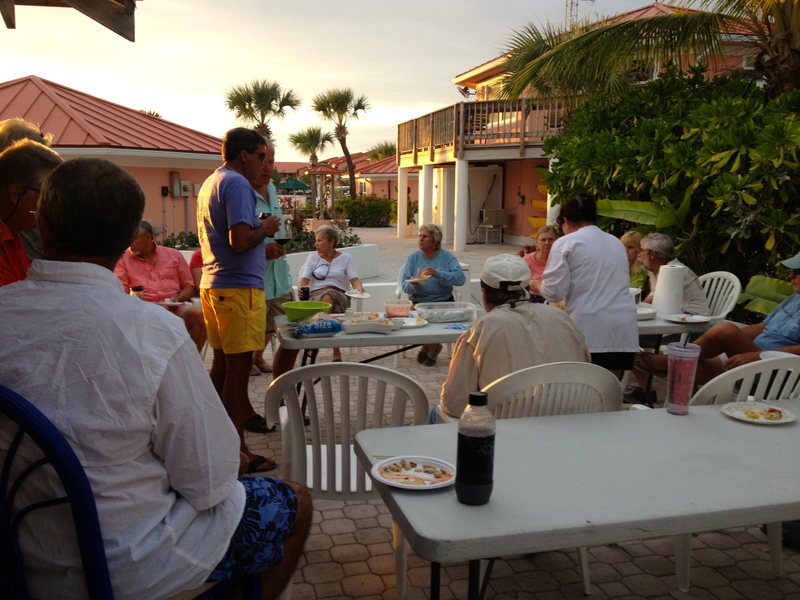 In the photo above we were enjoying sundowners at Bimini Sands Resort and Marina in Bimini with a large group of cruisers. 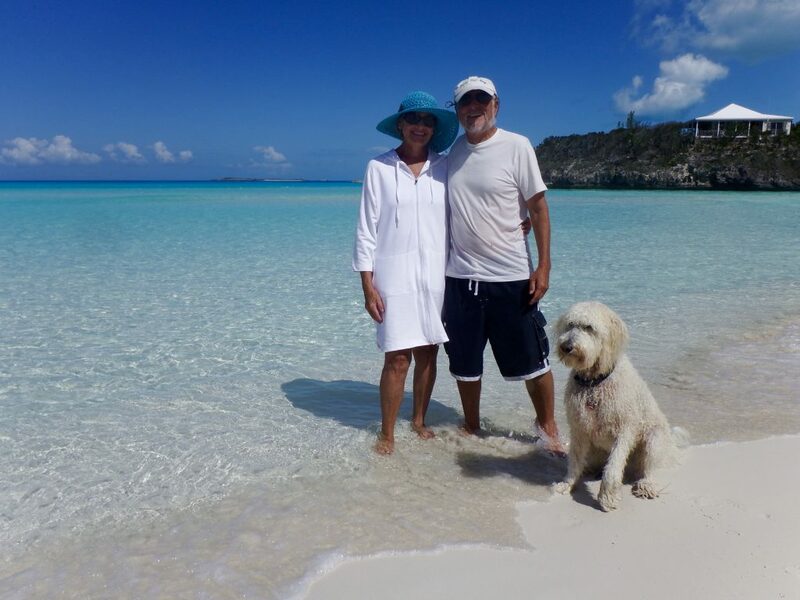 We were all stuck there for over three weeks in January, 2013, waiting for safe sailing weather so we could leave for the Exumas. 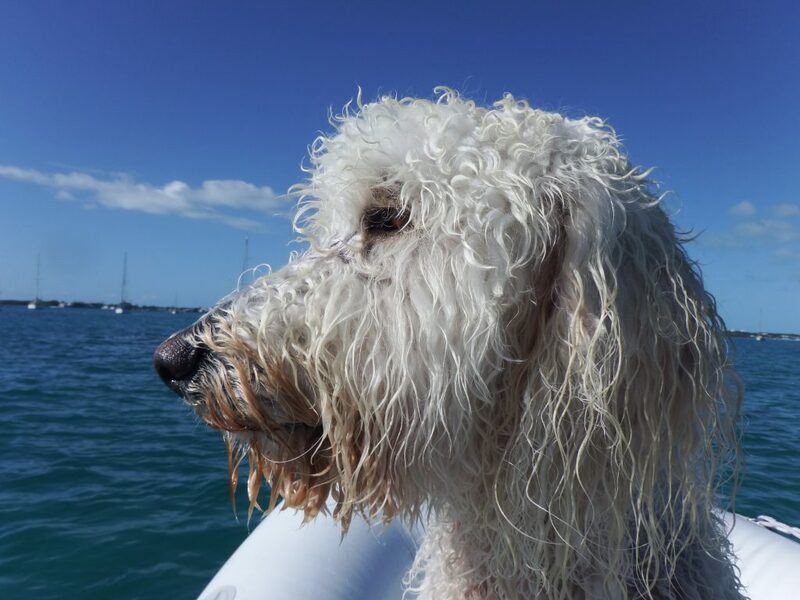 This entry was posted in and tagged Bahamas, Ft. Lauderdale, Miami, Stuart, Sunset Bay Marina on September 28, 2013 by Jan.
On July 24, 2013, our wonderful dog Daisy Doodle died. You can read about her here. 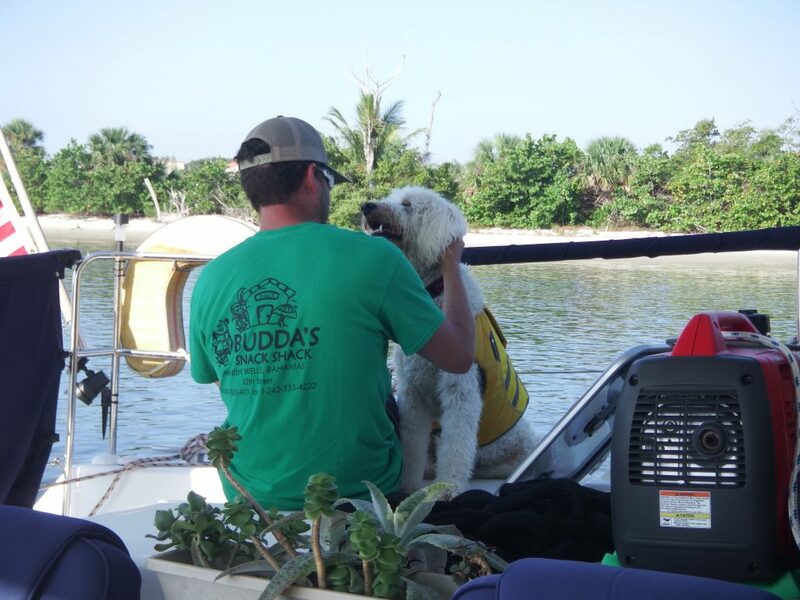 At first we didn’t know if we would get another dog while living aboard the boat. 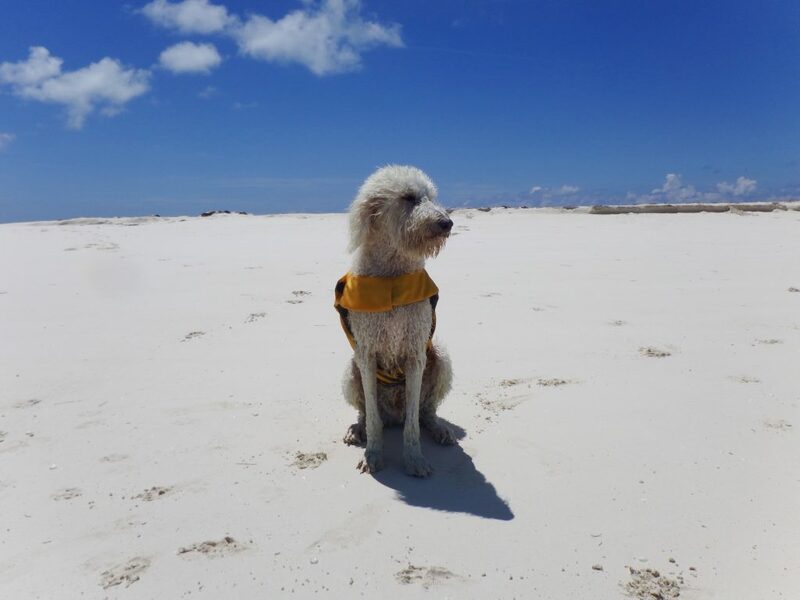 However, after realizing that Daisy was a big part of all of our cruising adventures, we decided to start looking for a puppy. We visited the local animal shelter and most of the dogs were pit bull mixes. Nearby rescues didn’t have any Goldendoodle puppies available. 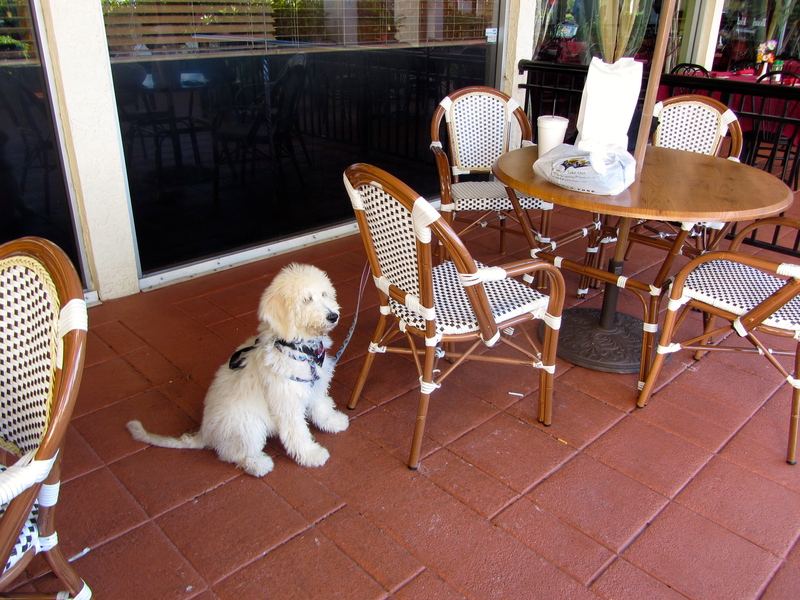 Eventually we found a breeder in Florida, Moss Creek Goldendoodles. We called Kelli, the owner, and she told us there were two puppies available. We found out later that this is highly unusual since most of their puppies are taken before the litters are even born. They do temperament testing on the puppies at six weeks and as soon as she had done this, she chose which puppy would be best for our living conditions. The other available puppy went to a family with children. We wanted to give him a nautical name and chose Sailor. We got to see him when he was eight weeks old. Moss Creek does not allow visitors until then because they are worried about the puppies getting Parvo. We fell in love but did not take him home right away. We decided to leave him there for another month to live with a trainer and attend “Boot Camp.” When we picked him up on September 7th he was very calm and well behaved. 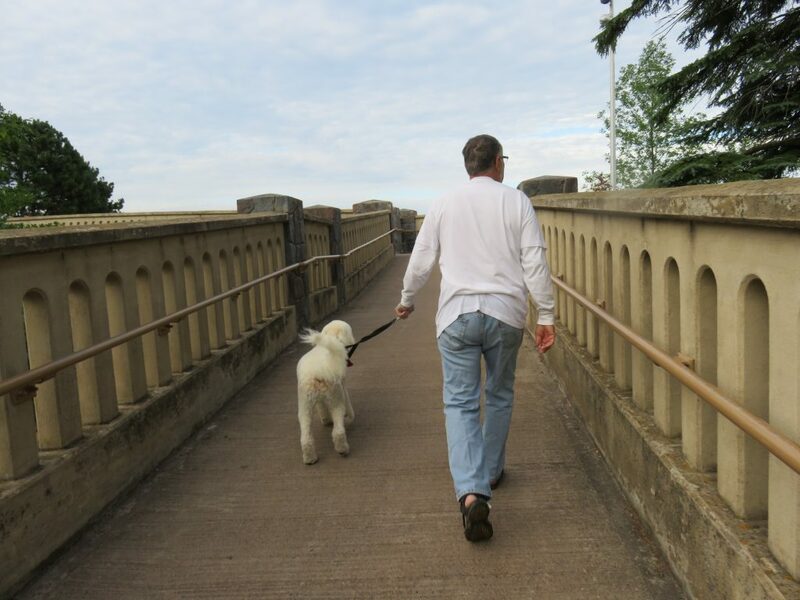 He was housebroken, walked nicely on a loose leash, was on a schedule that matched ours, was crate trained, and knew the basic obedience commands. He sits for everything: before he eats, before he goes outside or comes in, when someone wants to pet him during his walks, before he goes in his crate, etc. 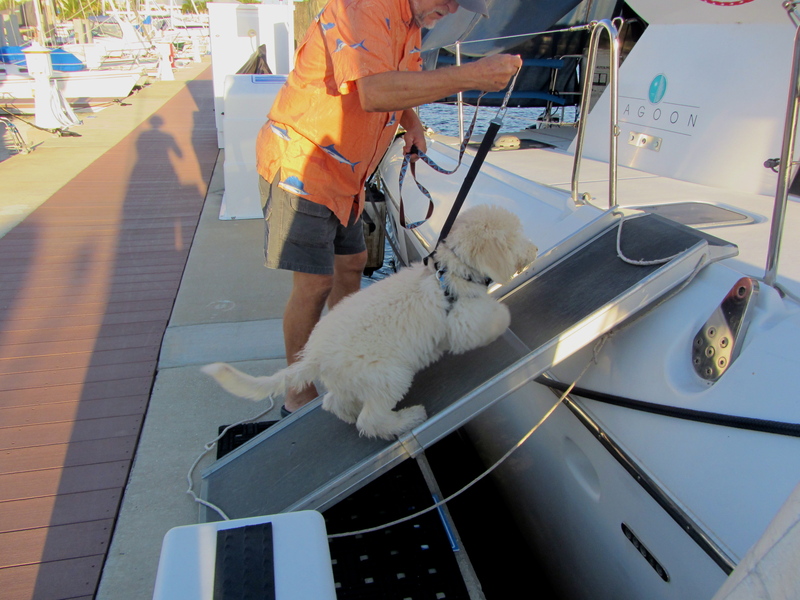 Of course, a very important thing for a boat dog to learn is to “go potty” on the deck. Daisy would never do this. 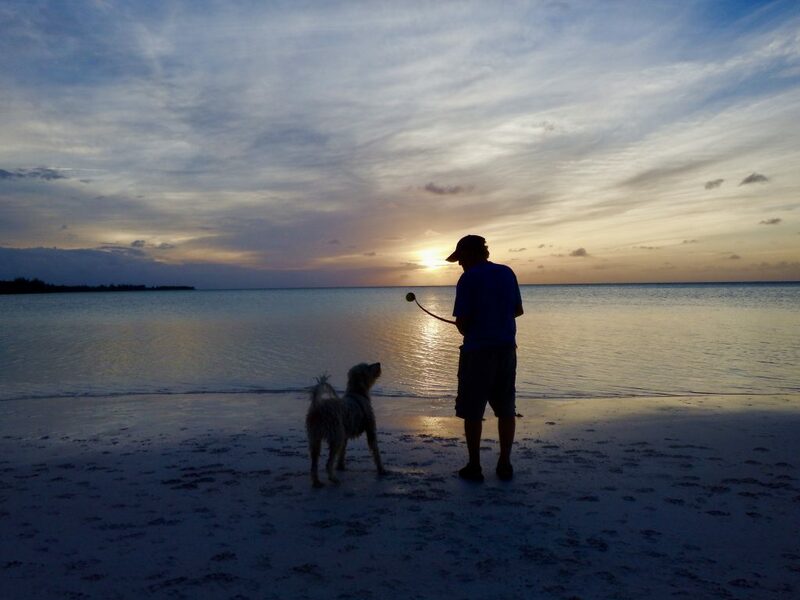 It’s rarely needed as we can almost always take him for walks ashore, but there are times when we must sail overnight or can’t get ashore due to weather or not finding a beach near an anchorage. Sailor was already trained to ring a bell when he needed to go outside. 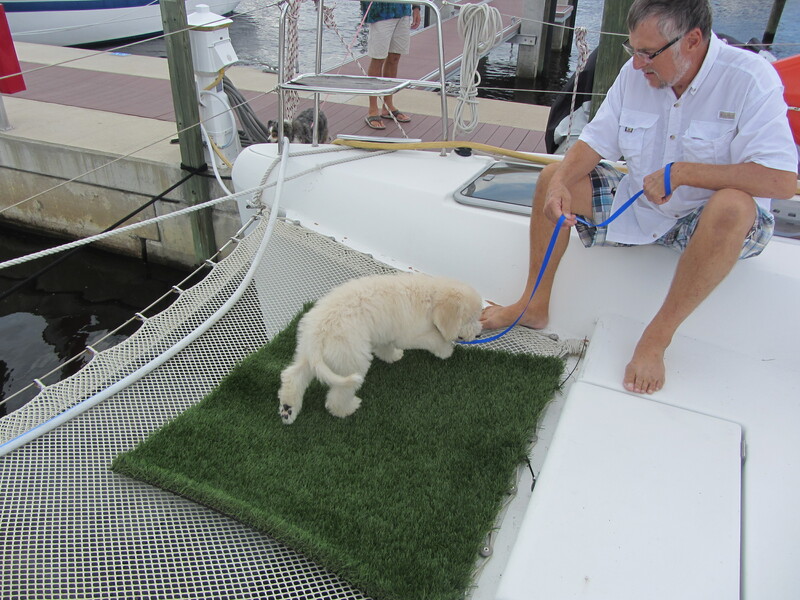 We took him on his leash to the front of the boat where we had placed a piece of artificial grass on one of the trampolines. By the end of the first day, he was “going” there. We also take him for four walks a day, after each meal and before he goes to sleep at night. 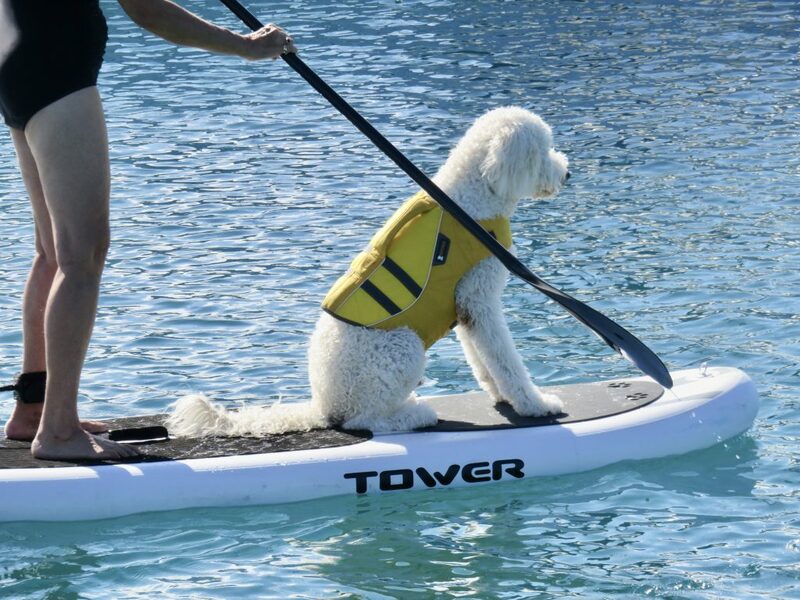 In between, he uses the boat, since puppies “go” a lot. Sailor is turning out to be more than we hoped for in a new member of our family. 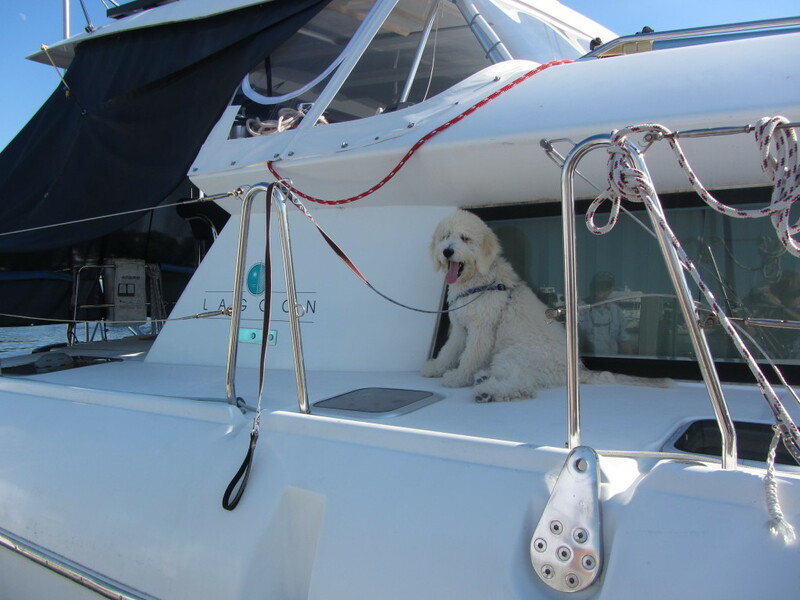 We will always miss Daisy but are so happy to have Sailor onboard with us. 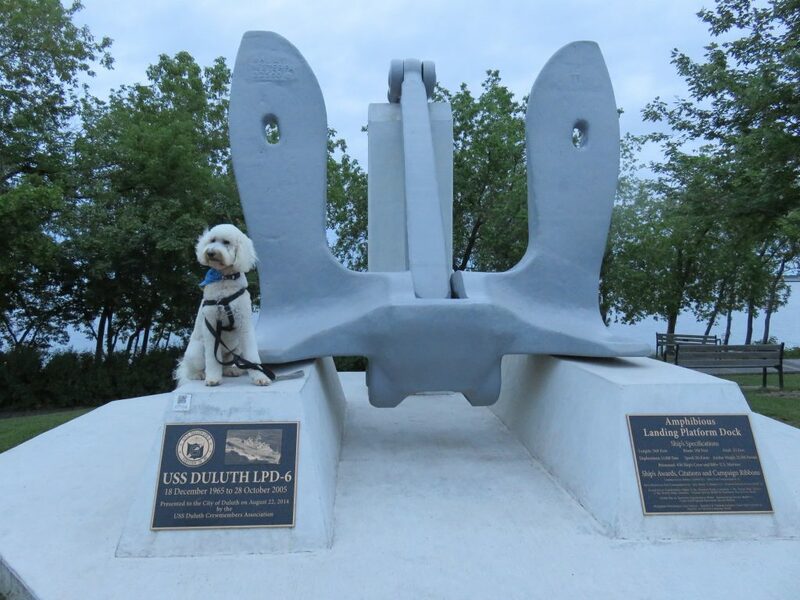 This entry was posted in Boat Dog, Sailor Doodle and tagged Goldendoodle, Housebreaking, Sailor, Stuart on September 28, 2013 by Jan.